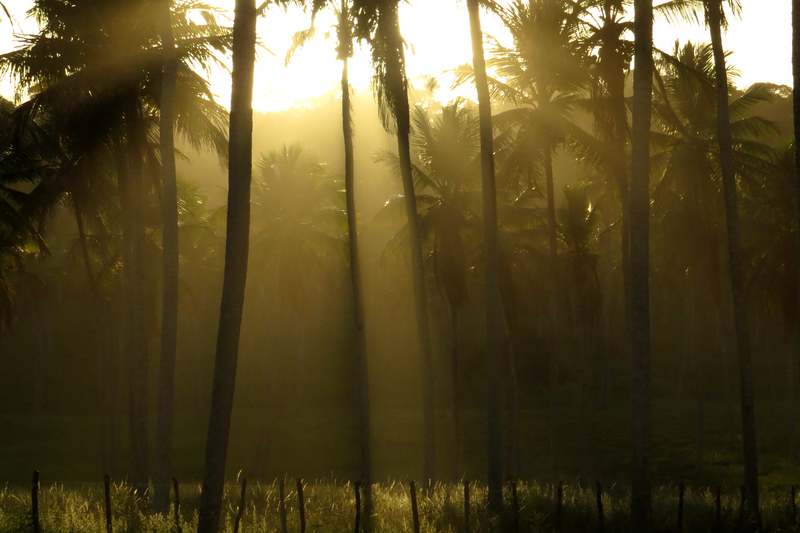 This is the fifth and final report on my north-east Brazil trip. 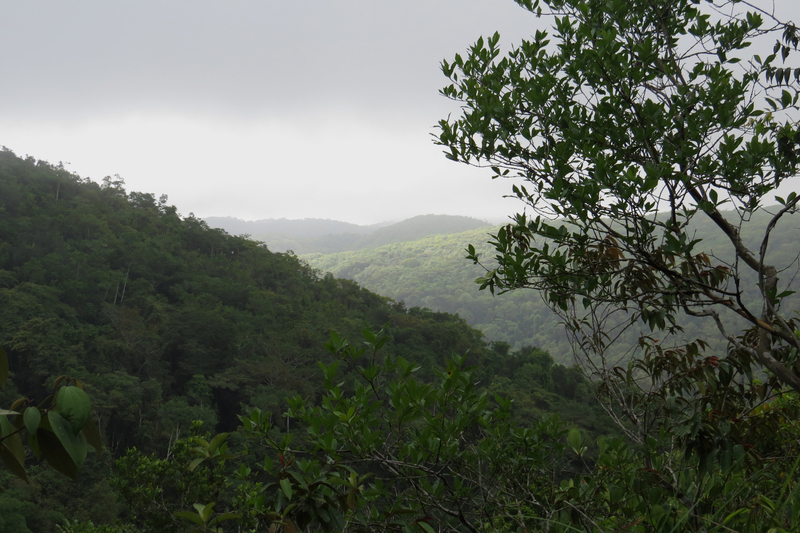 From Boa Nova we continued south to the Serra das Lontras range and the Serra Bonita reserve. From here we headed south-east reaching the coast at Porto Segura before heading north towards Salvador for our flight home. We spent three nights at the private reserve of Serra Bonita near the town of Camacan which produced some excellent birding. There was a beautiful panoramic view over the town from the restaurant, especially first thing in the morning. 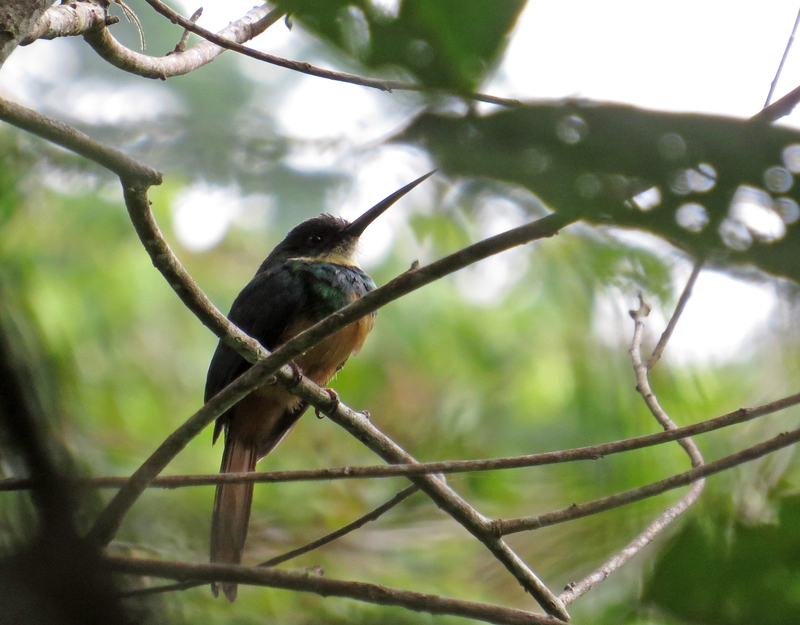 Here are a few birds from the Serra Bonita forests – Rufous-throated Jacamar …. …. but the star bird was this undescribed species of Heliobretus treehunter. 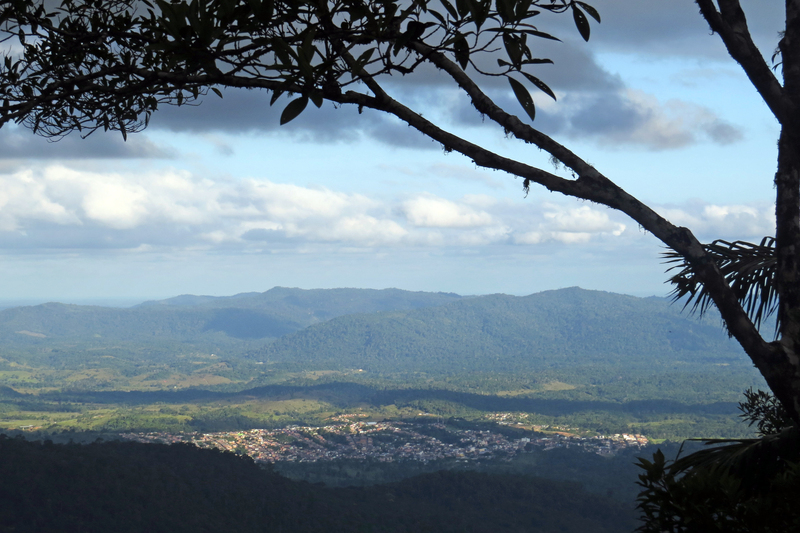 A full description is in the pipeline and it will probably be given the vernacular name of Serra das Lontras Treehunter. This is a copy of a print by Ciro Albano https://www.flickr.com/photos/ciroalbanofotos/ and is used with permission. … giving some most unusual effect when I engaged the maximum zoom setting. 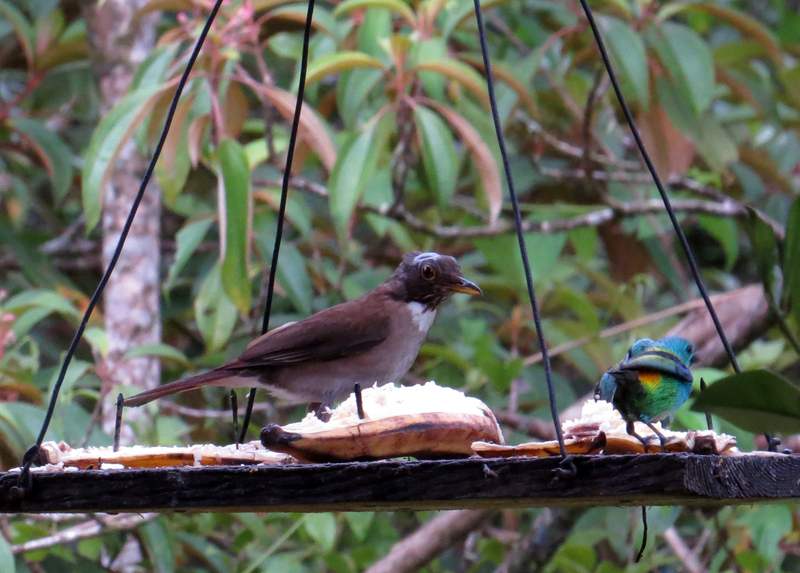 Feeders around the HQ gave some great photo opportunities – here a White-necked Thrush with two Green-headed Tanagers. 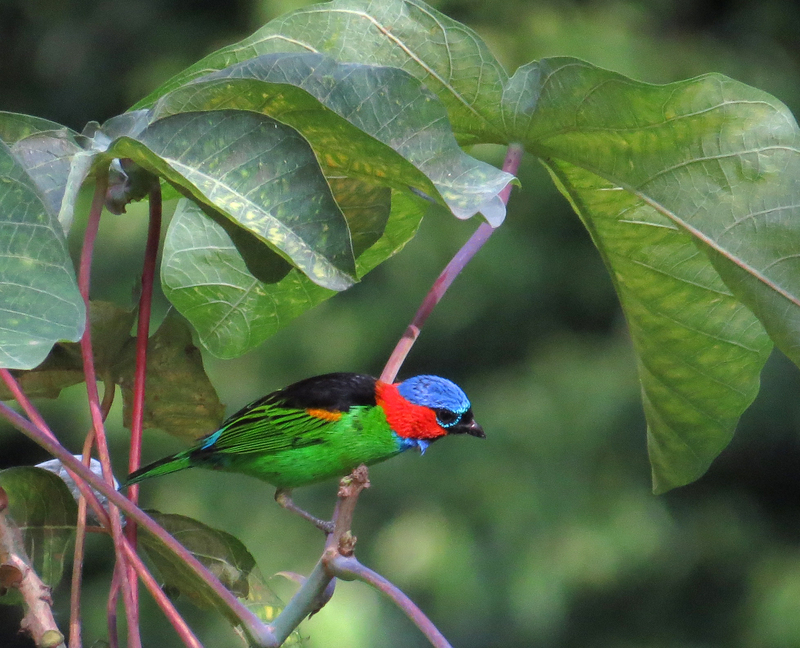 A Green-headed Tanager with a Green Honeycreeper. Female Green Honeycreeprs are just that, but the male is more of a blue colour. Chestnut-bellied Euphonias were out numbered by their orange-bellied cousins but I have kept a photo of that species for later. and finally the incredible Red-necked Tanager. The hummingbird feeders were filled just before dusk to give the birds some calories before their overnight fast. 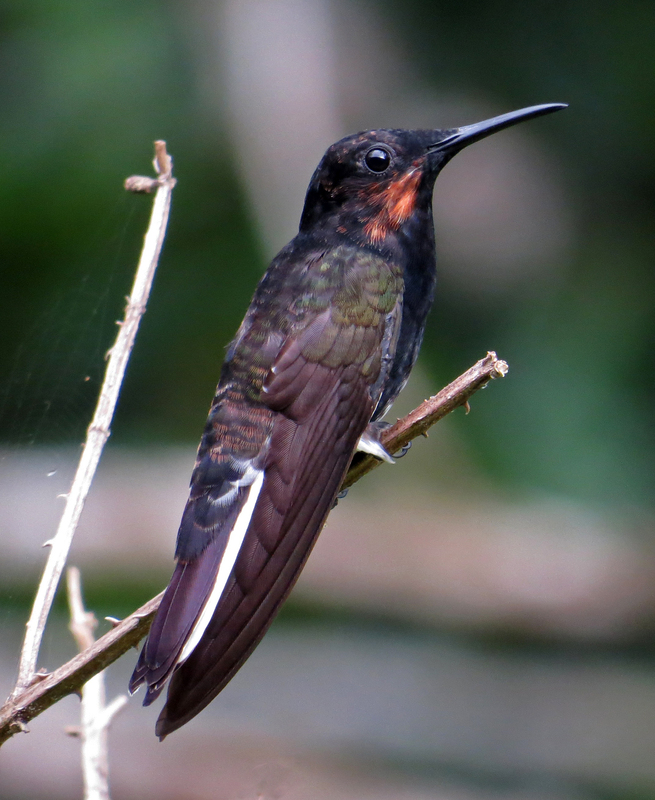 Here Sombre Hummingbirds and a Black Jacobin vie for position. A male Violet-capped Woodnymph catches the light just right. Only the immature Black Inca shows this brown moustachial stripe. A tiny female Frilled Coquette. 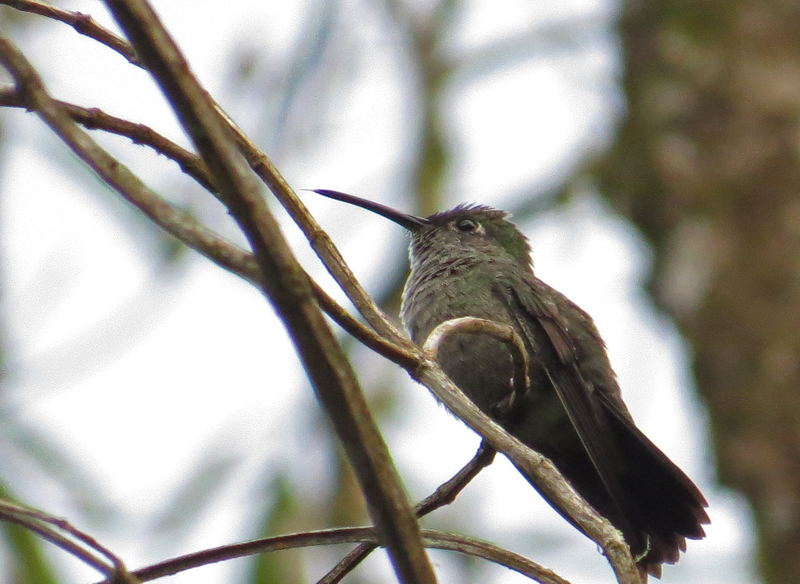 The smallest hummer in the world is the Bee Hummingbird of Cuba but the coquettes are not far behind. Our final success at Serra Bonita was distant views of the rare Mantled Hawk from the highest peak. The owner of Serra Bonita is a moth expert and runs a mercury vapor light regularly. 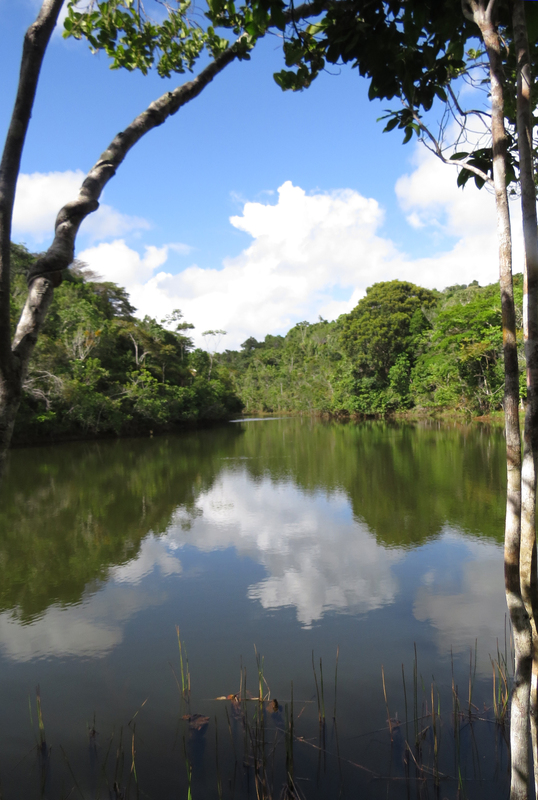 Of the 24,000 species known from Brazil, he has identified 12,000 just on this reserve. This contrasts with just 2,500 ever recorded in the UK where there are thousands of moth enthusiasts trapping on a regular basis. I’ve no idea of the name but presume this is some species of Hawk-moth. An unidentified micro-moth, a clearwing and what I presume is a one of the Geometridae. From Serra Bonita we continued to the most southerly point of the trip at Porto Segura. 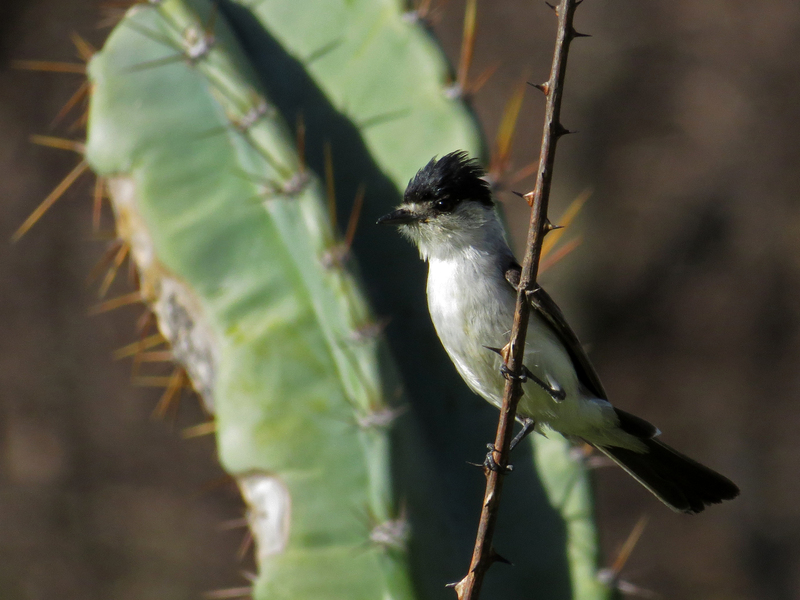 On route we saw many interesting species varying from the widespread Variegated Flycatcher …. …. and Southern Roughwing …. …. 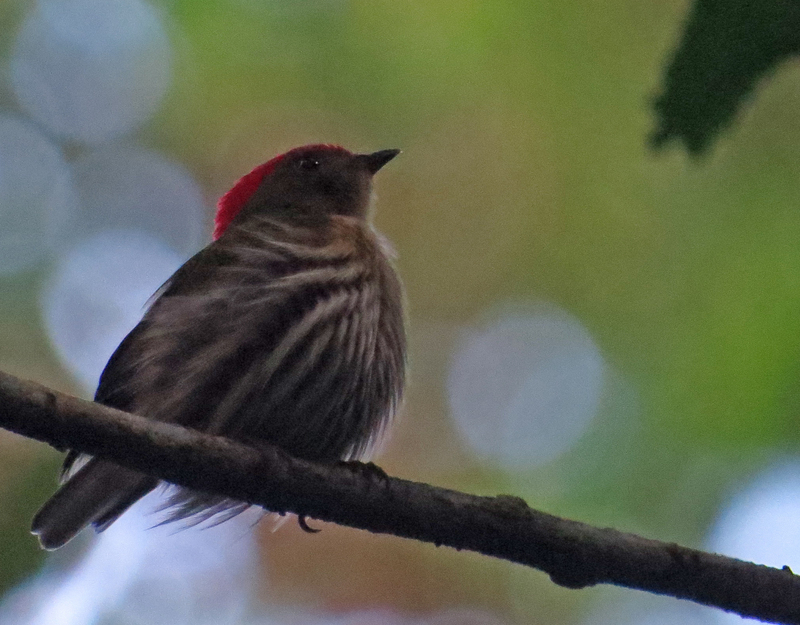 to the range restricted Eastern Striped Manakin …. …. 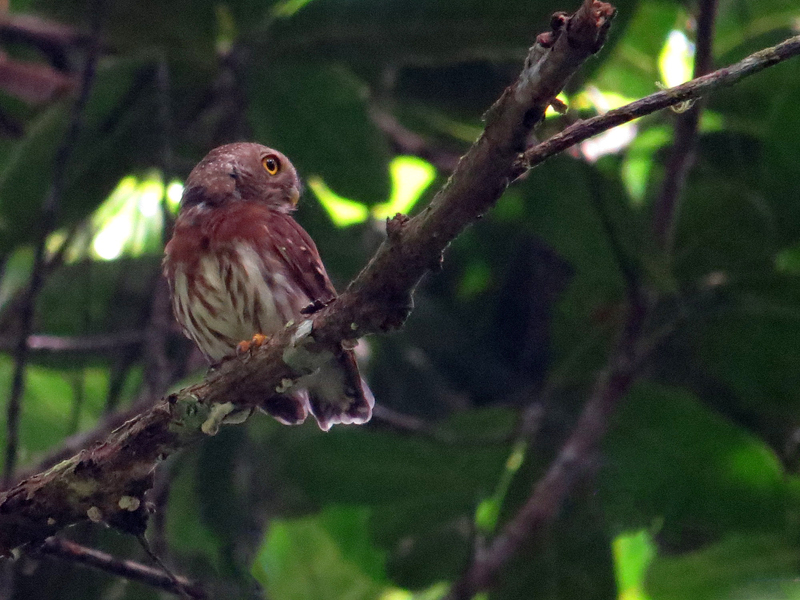 and Least Pygmy Owl. 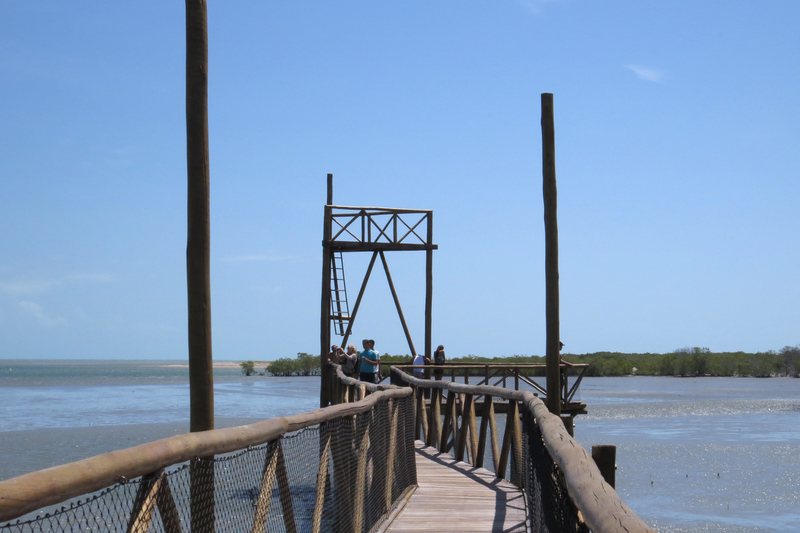 Porto Seguro is famous as the first place in modern Brazil to be visited by Europeans, being first visited by the Pedro Álvares Cabral expedition in April 1500. As the area lay within the part of the world allocated to Portugal by the Treaty of Tordesillas, a Papal Bull declaring that all newly discovered lands were to be divided up between Spain and Portugal, the region was claimed for Portugal. 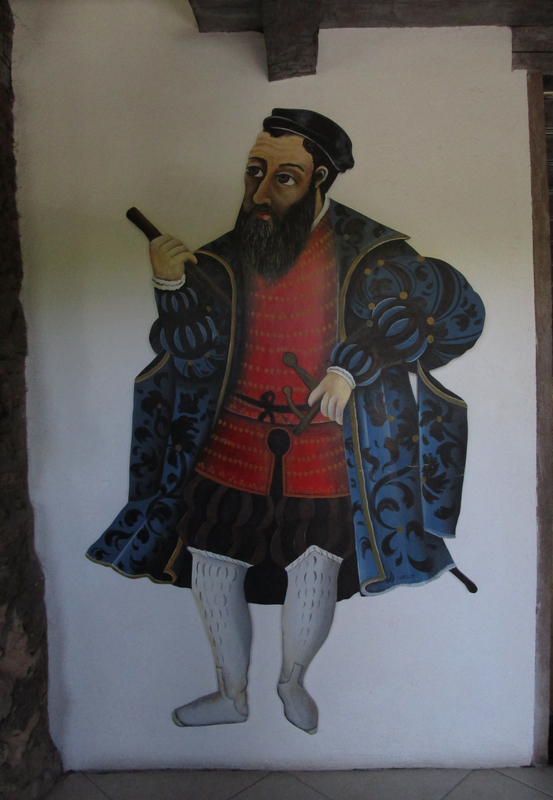 This characature of Pedro Álvares Cabral was painted on the wall of the foyer of our hotel. 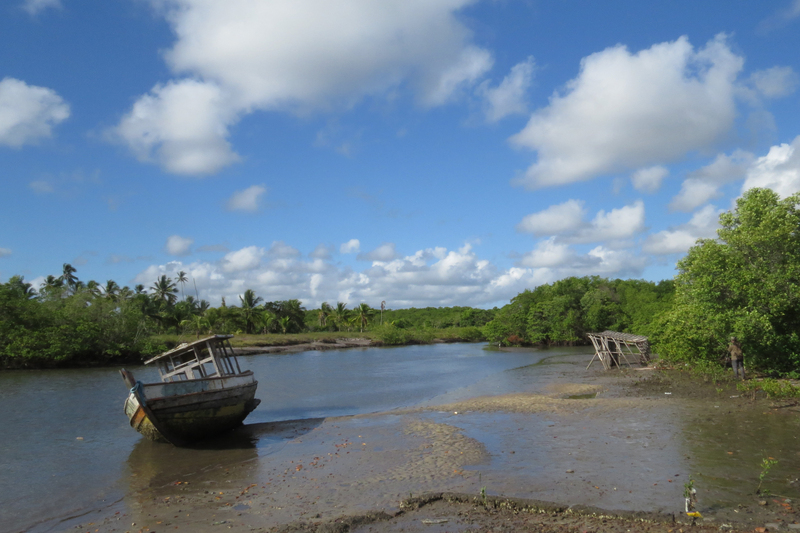 From Porto Seguro (the southernmost point of the trip) we headed north to Itacaré, our final birding destination. 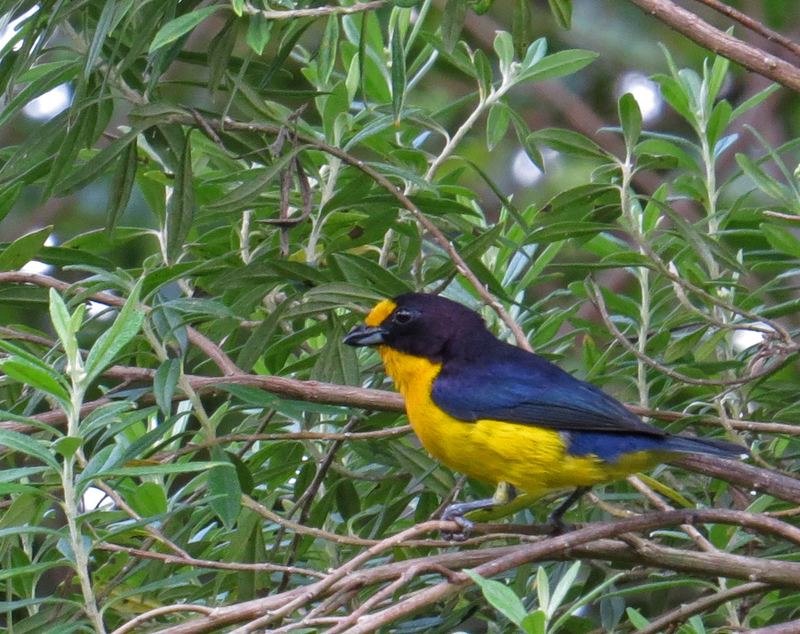 On route we stopped at our guide Eduardo’s brother’s house where we could see lots of nice birds coming to the feeder such as this Orange-bellied Euphonia …. The following day we birded nearby forests seeing many species such as this Black-necked Aracari …. …. 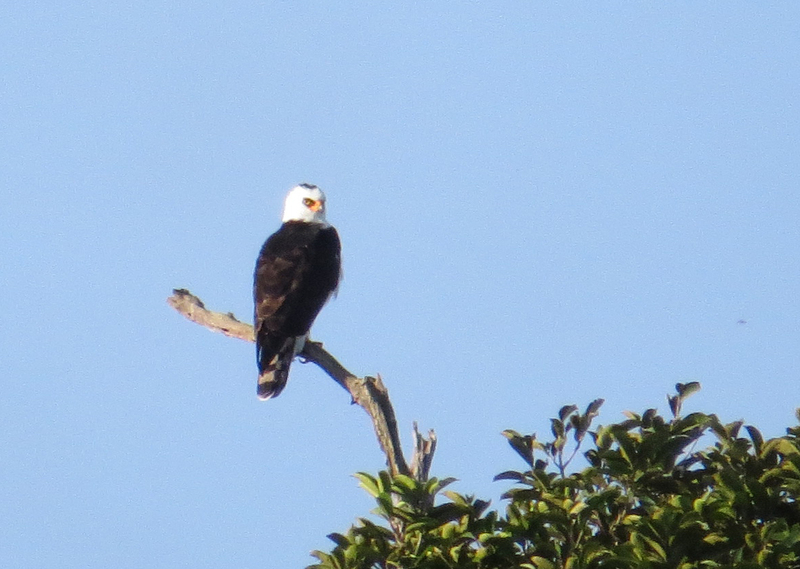 and this magnificent Black-and-White Hawk-eagle. This is the first time I have seen an adult of this species and the first time perched. 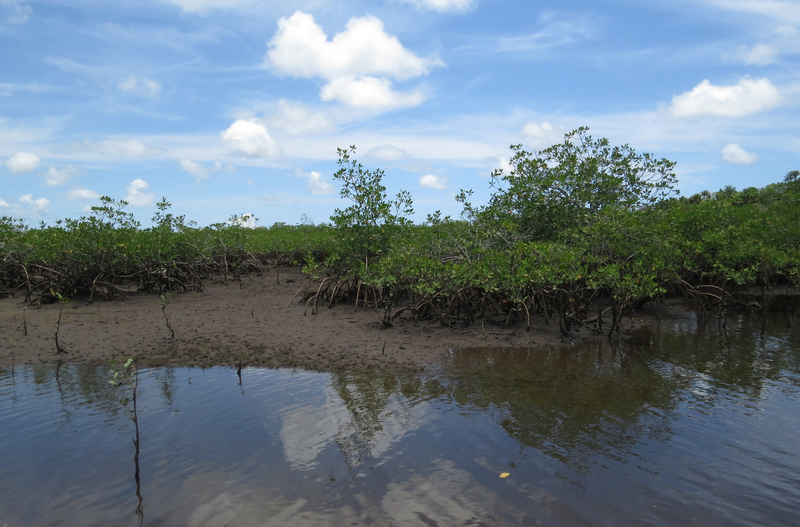 Later in the day we called in at an extensive area of mangroves in the hope of see the two species of rail that we had failed to find earlier in the trip, Little Wood-rail and Mangrove Rail. It was very hot and we had no luck. We hoped to return the next day but unfortunately it didn’t pan out that way. 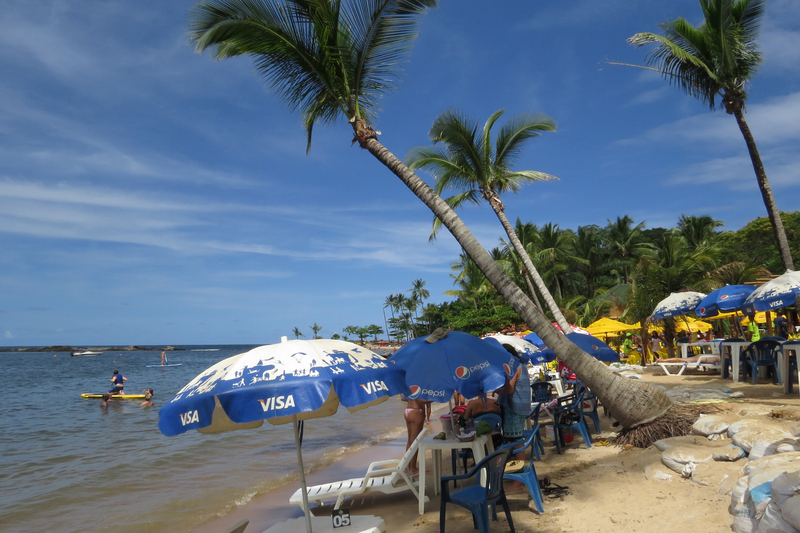 We had lunch by the beach at Itacaré …. 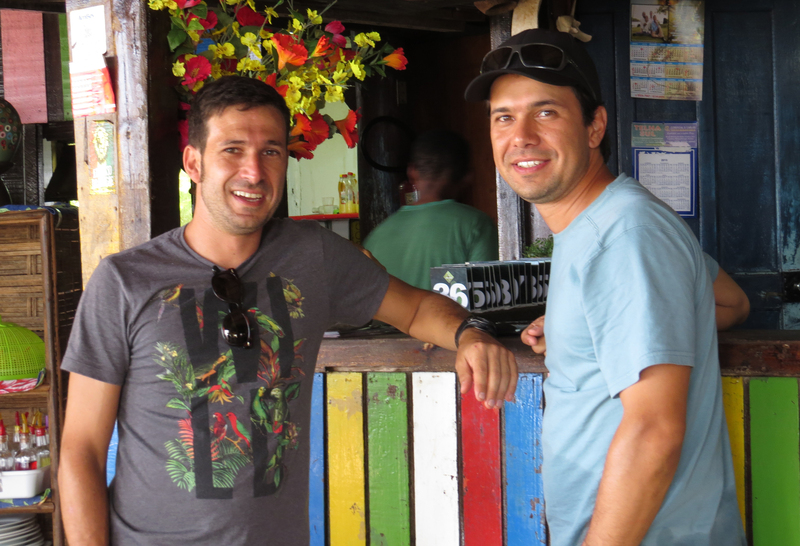 … at a beach restaurant run by (on the left) Eduardo’s brother Leo. In the afternoon we visited the Catitu private reserve. …. 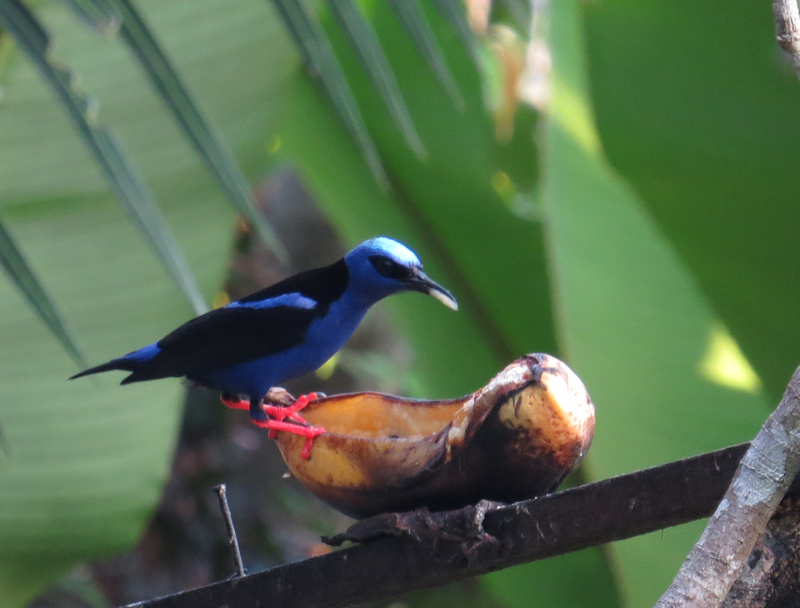 and White-winged Cotinga showed well. 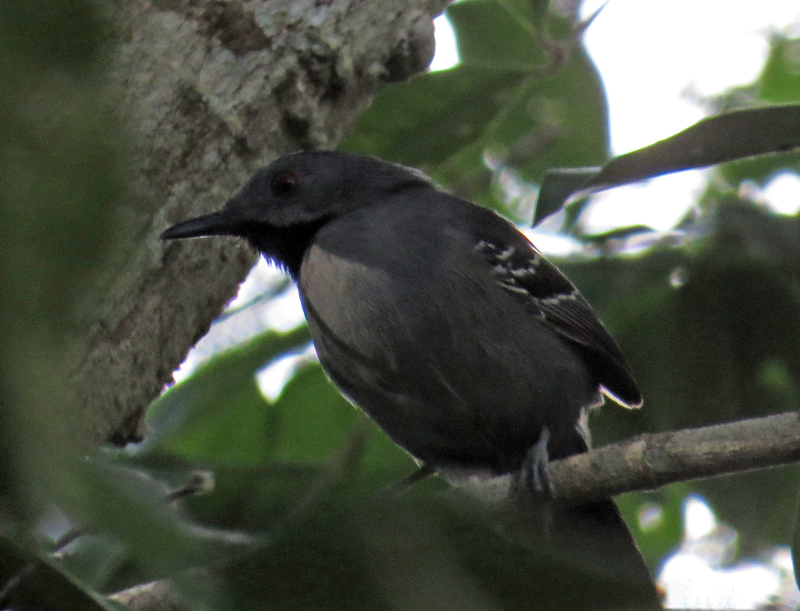 Bare-throated Bellbird was seen at a distance (but I only got very poor photos) but the best of all, the rare Banded Cotinga, was seen perched at such a distance that it couldn’t be identified until it flew. Our final night was again spent in the pleasant holiday resort of Itacaré. 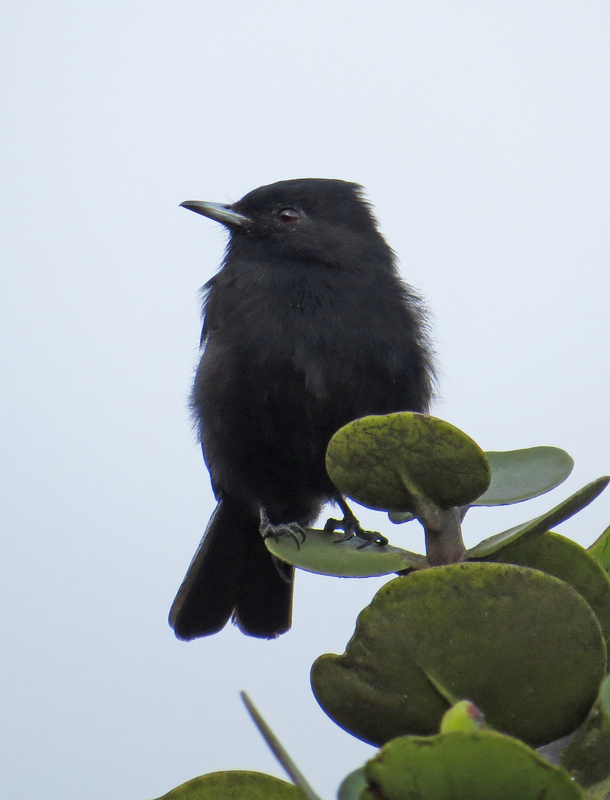 The following morning we revisited Catitu in the hope of better views of Banded Cotinga. We had a very birdy morning but failed with our primary target. This was the only day on the whole trip when I failed to pick up a life bird. Then it was long drive north to Salvador for our flight to Lisbon and home. Initially following the coast road, the journey was delayed by poor roads, heavy traffic, a funeral procession and (above) a fiesta, but we arrived at the airport in good time, so concluding an excellent trip. I personally recorded just short of 500 species. I had expected 65 life birds, 70 if I was very lucky, I got 78 and saw a couple of fantastic species that I didn’t know were even possible on this itinerary. There is a lot of driving on this trip but the results make it more than worthwhile. But I will finish this narrative with another bird that deserves the epithet of ‘bird of the trip’ and one that wasn’t on my radar at all at the start. 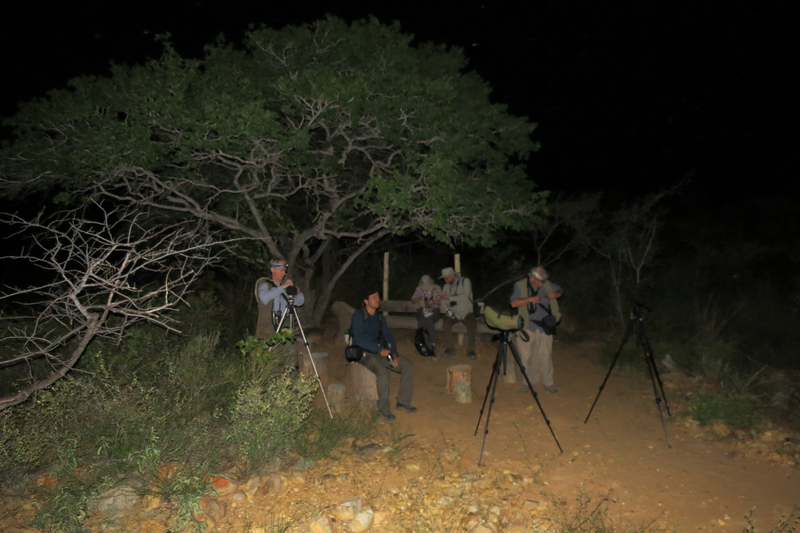 We bumped into Ciro Albano and his group at Veracel reserve near Porto Segura and after dark we all were able to get great views of two White-winged Potoos. Photo by Ciro Albano from the Internet Bird Collection. Continuing the journey south through north-east Brazil, our group arrived at Boa Nova in Bahia State on the afternoon of the 23rd. 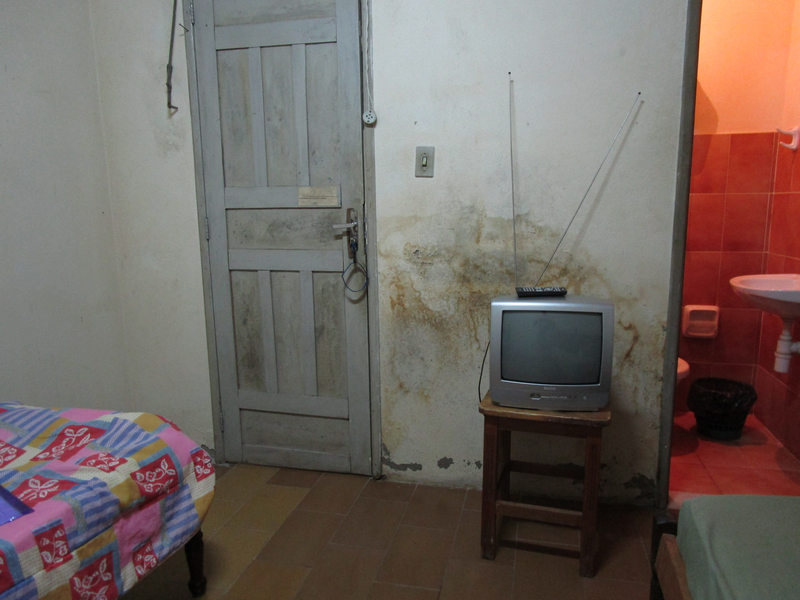 Although I have stayed in worse, the accommodation in Boa Nova was clearly the least luxurious of the trip. 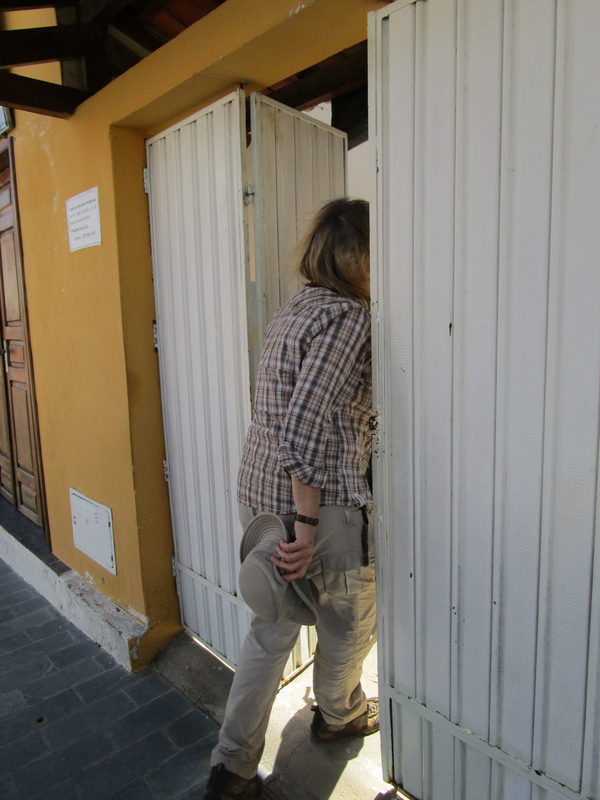 Entrance to our rooms was through a padlocked gate in the street. I understand that a new hotel has been opened recently so this shouldn’t put others off visiting. Rooms were a bit dingy, there was a lot of noise from the street and I was plagued by mosquitoes in the night. There was even the legendary chewing gum on the bedstead (from 1950’s Lonnie Donegon song for those too young to remember). The birding however was outstanding. 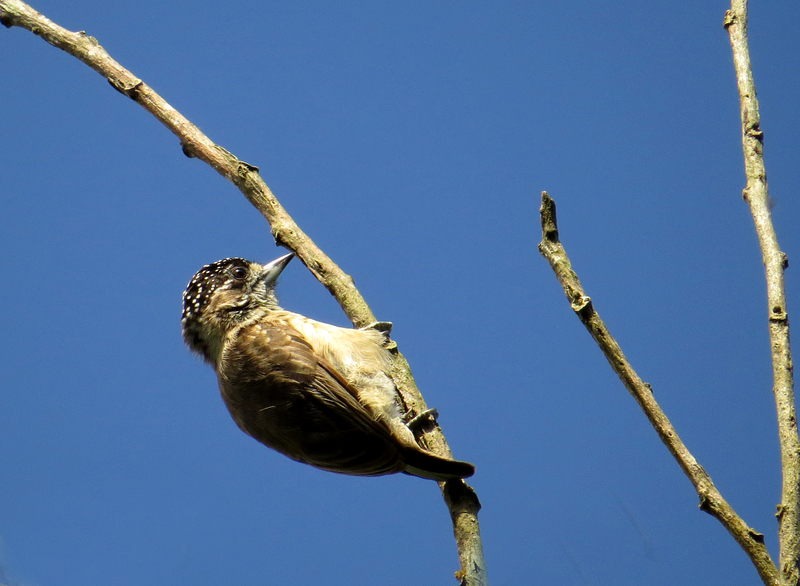 This Black-billed Scythebill, a rare relative of the woodcreepers, gave reasonable views. 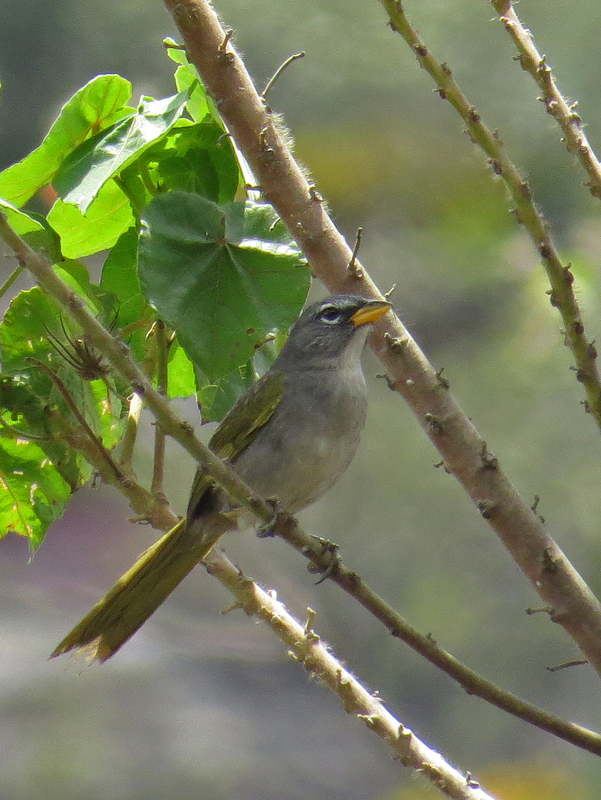 Several Pink-legged Graveteiro’s, showed in the canopy. This species of furnarid was only described in 1996. Sharpbills gave their falling bomb whistles from the trees. 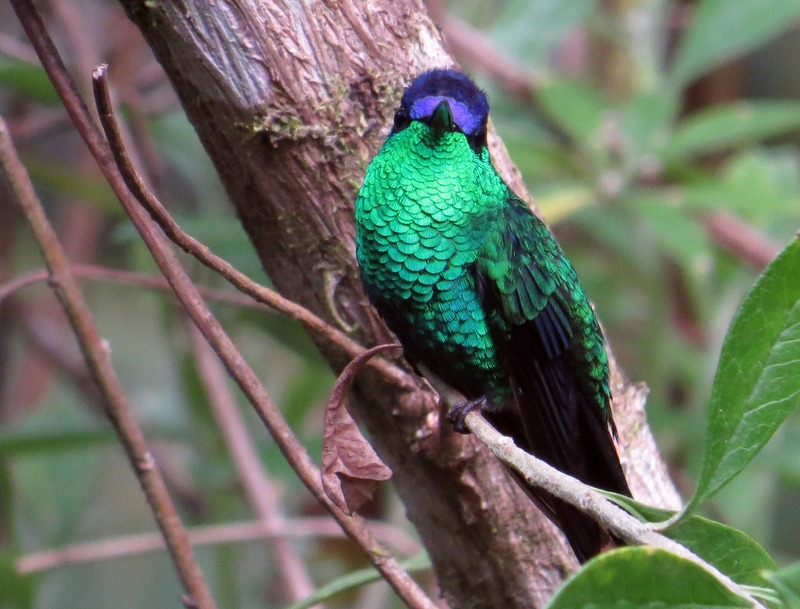 This species has been considered to be a cotinga or has been placed in a family of its own, but has now ended up in the Tityridae along with such other neotropical oddballs as the tityras, royal flycatchers, schiffornis, myobious, purpletufts (see below), xenopsaris (see below), becards and some of the mourners. As usual ant-thingies were a regular feature. 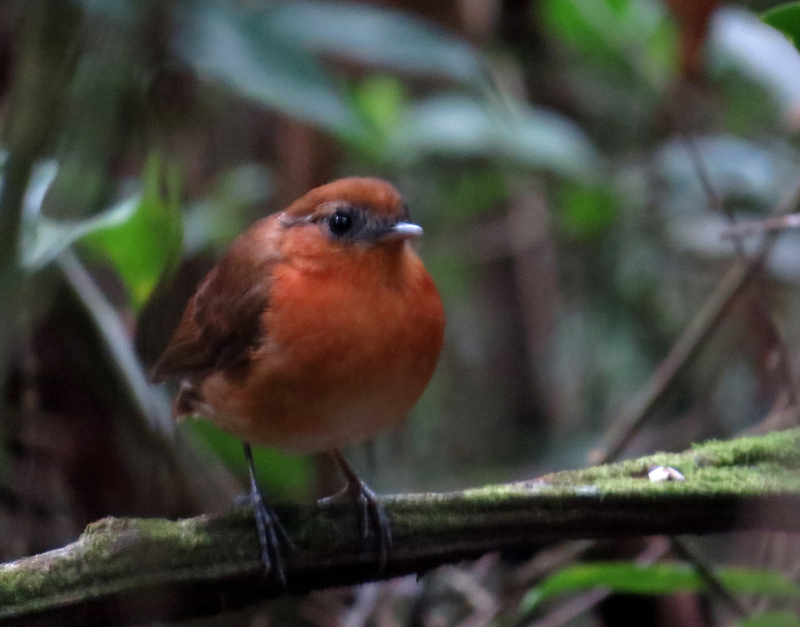 This is an Ochre-rumped Antbird …. …. 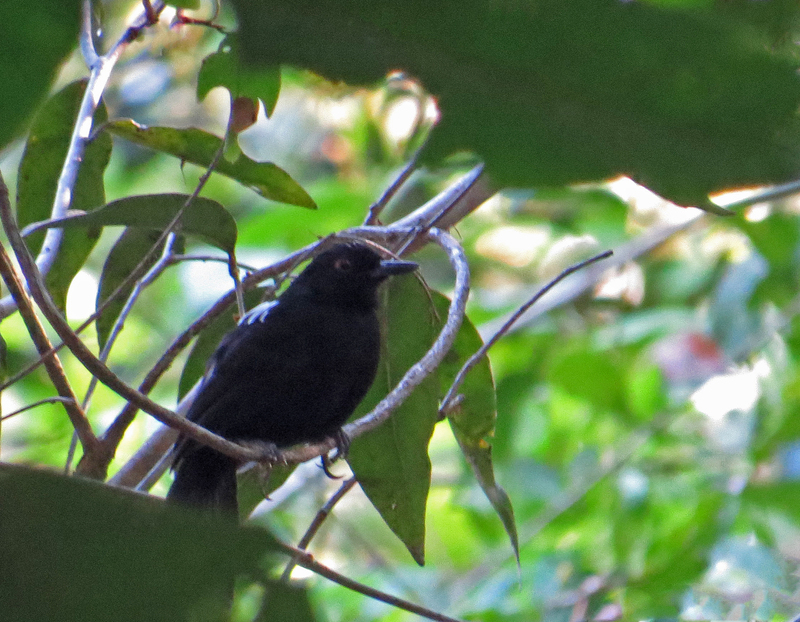 a male Slender Antbird …. …. 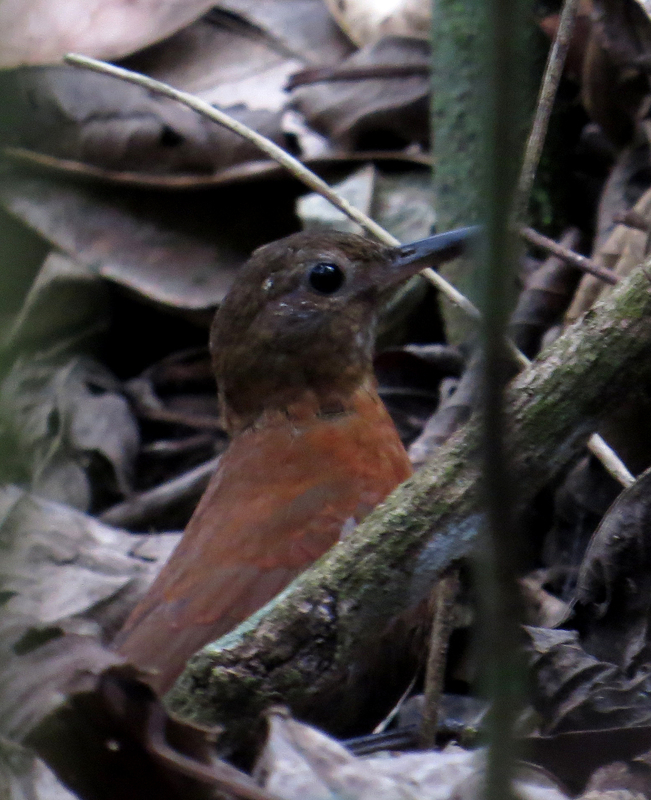 and here the even more elusive female Slender Antbird. One of the cutest birds of the trip was the diminutive Buff-throated Purpletuft. Now, as I said above, a member of the Tityridae. Mammals even got a look in. This is the rare Weid’s Black-tufted-ear Marmoset. 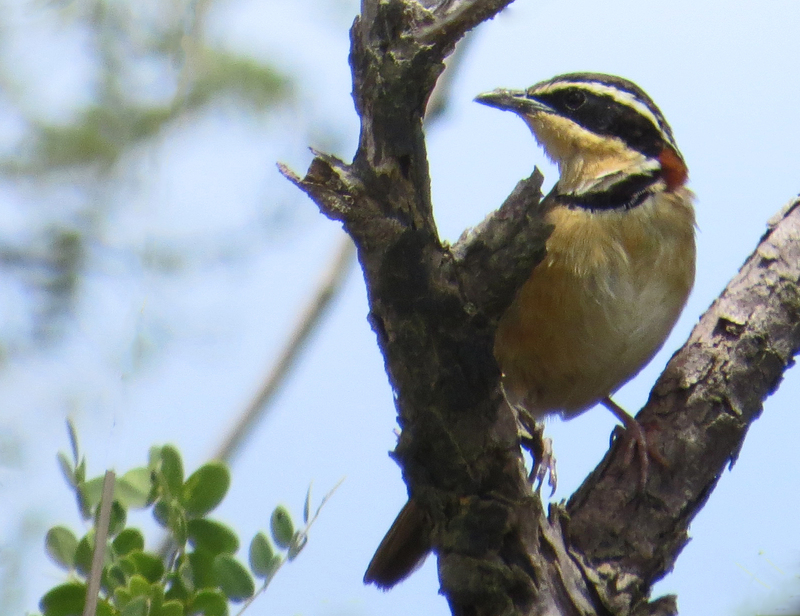 In a drier, more open area we saw a pair of White-naped Xenopsaris. This species occurs over a wide area but is always scarce. This is the fourth South American trip I have seen this bird on, but up to now it’s just been one per trip. Part of two afternoons were spent searching a rocky outcrop …. … it was covered in cacti so you had to watch your step. 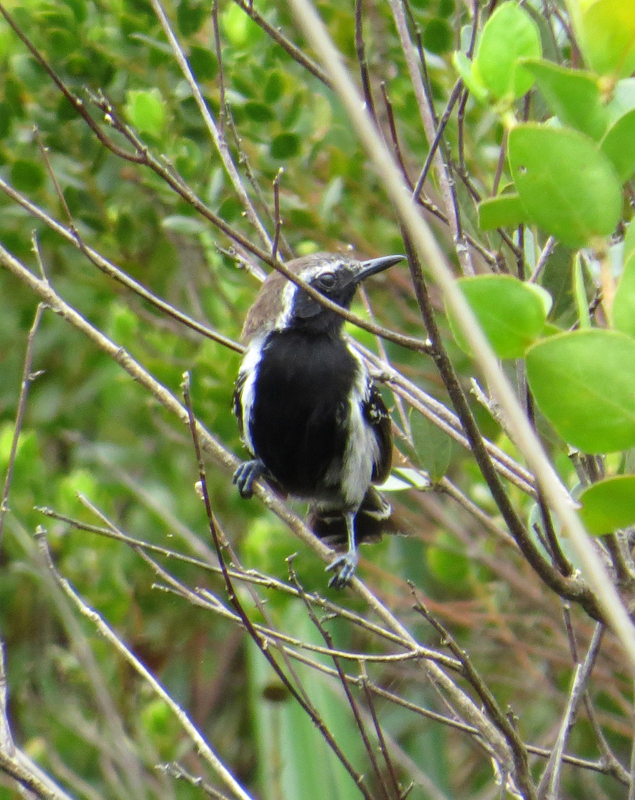 We had great views of several seedeaters including this White-throated and the rarer Dubois’ …. 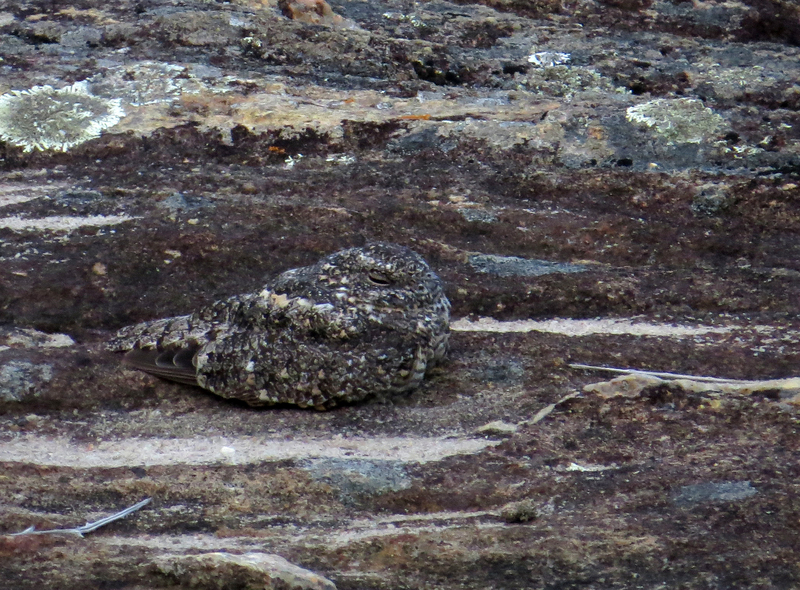 … but our main target was Pygmy Nightjar which we found just before dusk, perfectly camouflaged on the rock. 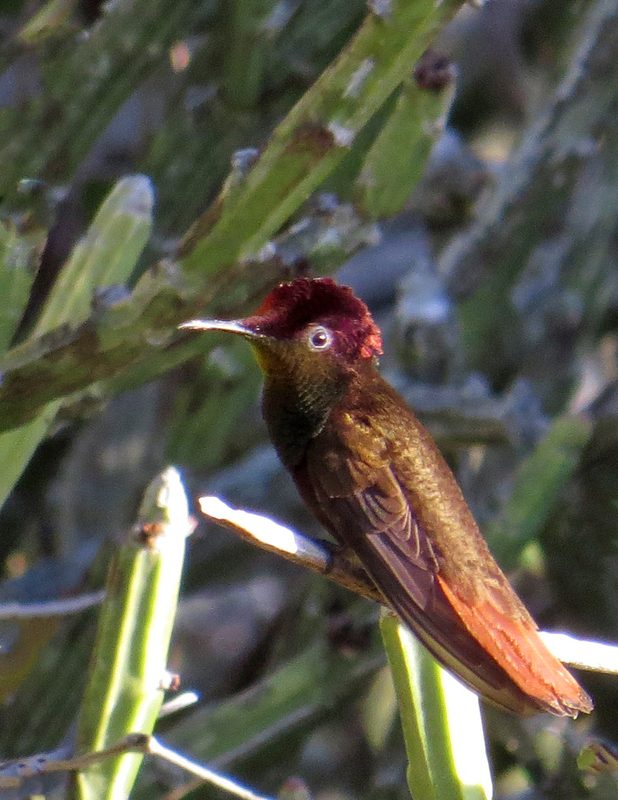 The flowers of the cacti attracted many hummingbirds …. …. 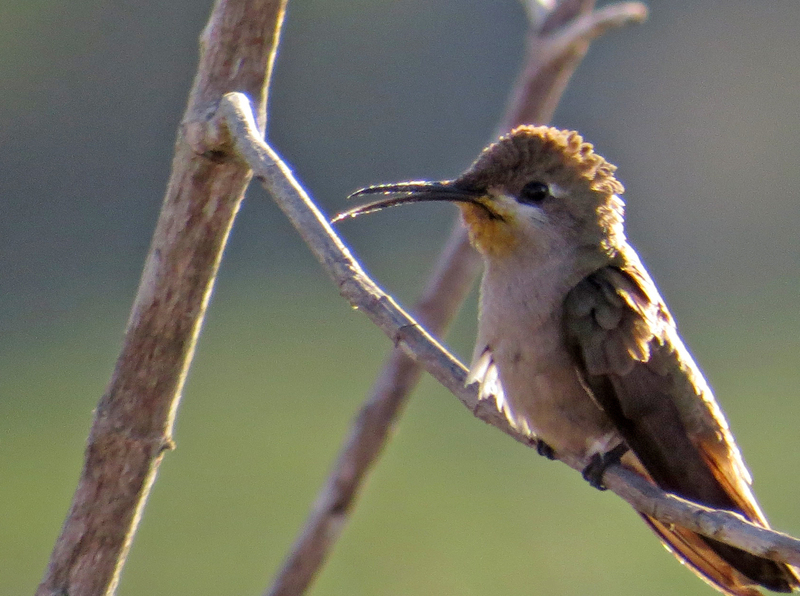 a female Ruby Topaz Hummingbird …. …. and the brighter male. Hummingbirds have feathers that shine iridescent from certain angles. 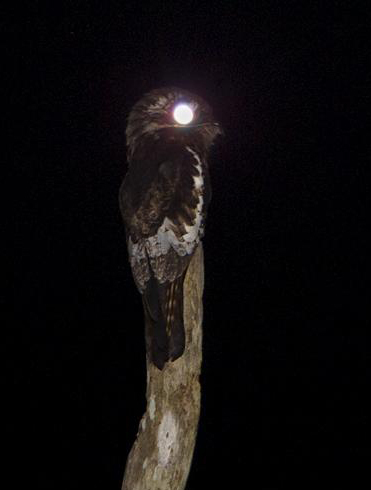 The entire bird will never glow at the same time. 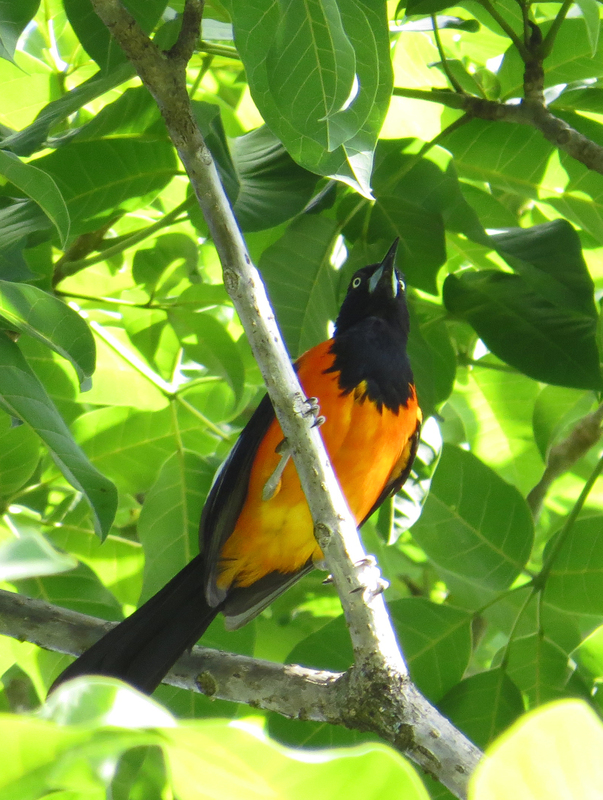 As this bird turns its ruby crown will turn black but its gorget will light up a bright orange. 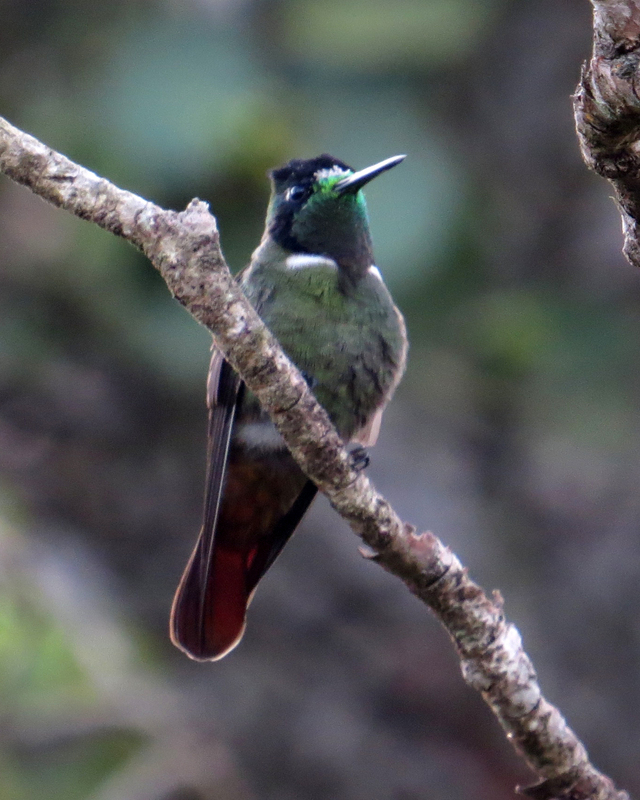 Similarly this Glittering-bellied Emerald will only live up to its name when viewed from a certain angle. But the bird of the day, no, the bird of the trip, was seen at a nearby marsh after dark. We had fantastic views of a Giant Snipe by torchlight. Almost half as big again as a Eurasian Woodcock, this monster of the marshes showed well for several minutes. OK the photos aren’t brilliant but it was some way away and lit just by the torch beam. Araripe Manakin and Lear’s Macaws were expected highlights of the trip, this wasn’t, hence my decision to give it the honour of ‘bird of the trip’. 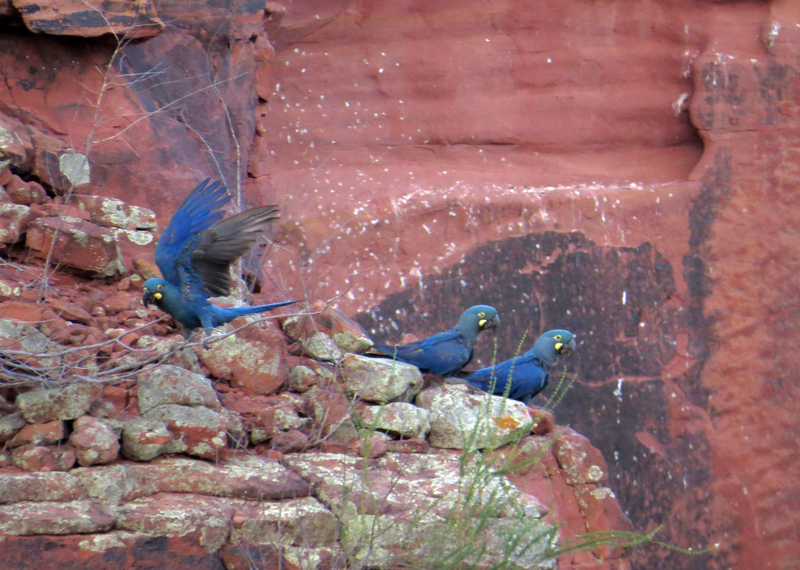 The last Brazil post dealt with our visit to the Canudos Biological Reserve and its wonderful Lear’s Macaws. From here we drove south-east to Jeremoabo and the following day continued to the coast at Palmares in coastal Pernambuco. Pectoral Antwren, one of many species of antwren seen on the tour and one that is restricted to far eastern Brazil, was a highlight of our time at Jeremoabo. Burrowing Owls could be seen along the sides of the road in open areas. 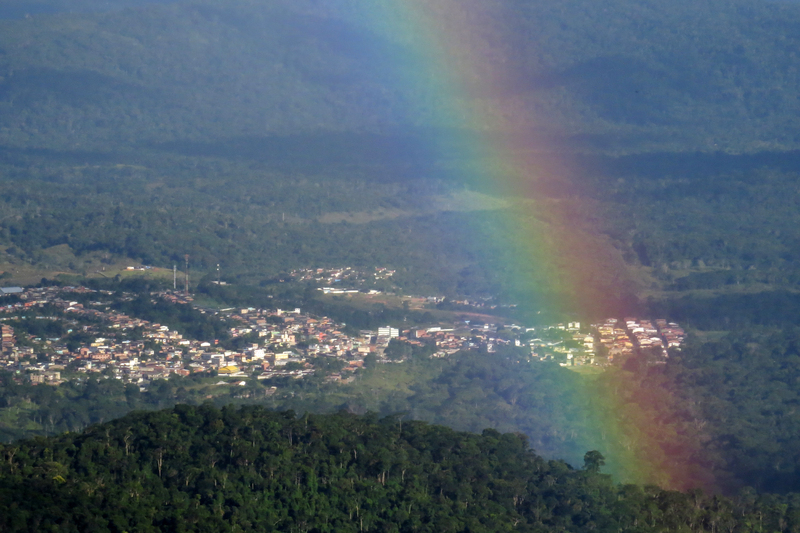 The area around Palmares is part of the ‘Pernambuco centre of avian endemism’. Unfortunately the vast majority of forest has been converted to sugarcane or banana plantations and the remaining endemic birds are critically endangered. Some forest does remain, but it is severely fragmented. In Europe or North America forest birds would disperse from one patch to another so bolstering the population, but here each population becomes increasingly isolated and inbred so numbers are falling at an alarming rate. Alagoas Foliage-gleaner, Pernambuco Pygmy-owl and Cryptic Treehunter may already be extinct and Alagoas Antwren, Pinto’s Spinetail and White-collared Kite may soon be following them into oblivion. Originally three days were scheduled for this area but rather than ‘flog a dead horse’ our time was cut to a day and a half, allowing us to see some of the specialities without wasting time on birds that had already disappeared. Frei Canaca reserve is typical of the plight of the NE Brazilian coastal rain forest, being encircled with and fragmented by plantations. We saw some good birds here but they were in very low density and it was hard work! 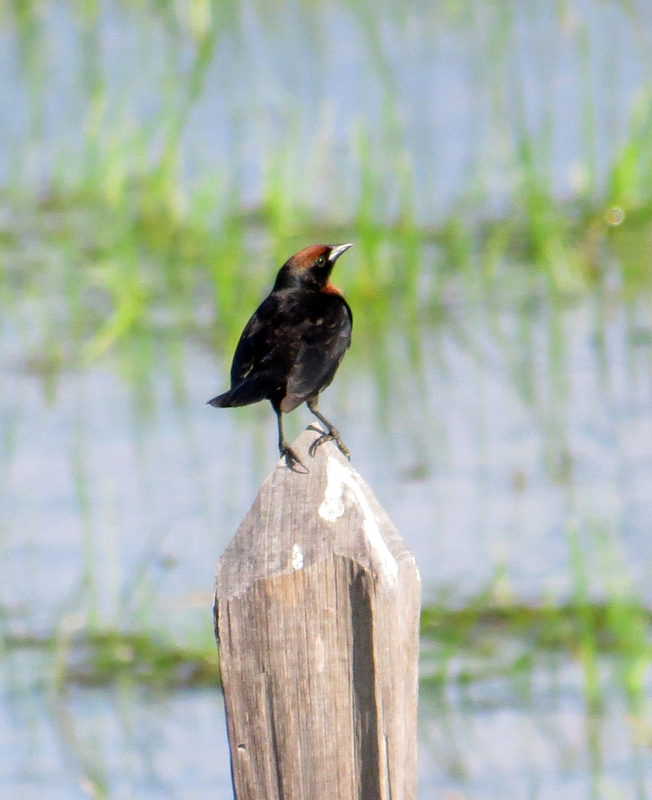 I wasn’t able get good photos of any of the Pernambuco forest birds but in coastal marshes we saw and photographed the equally rare Forbe’s Blackbird. 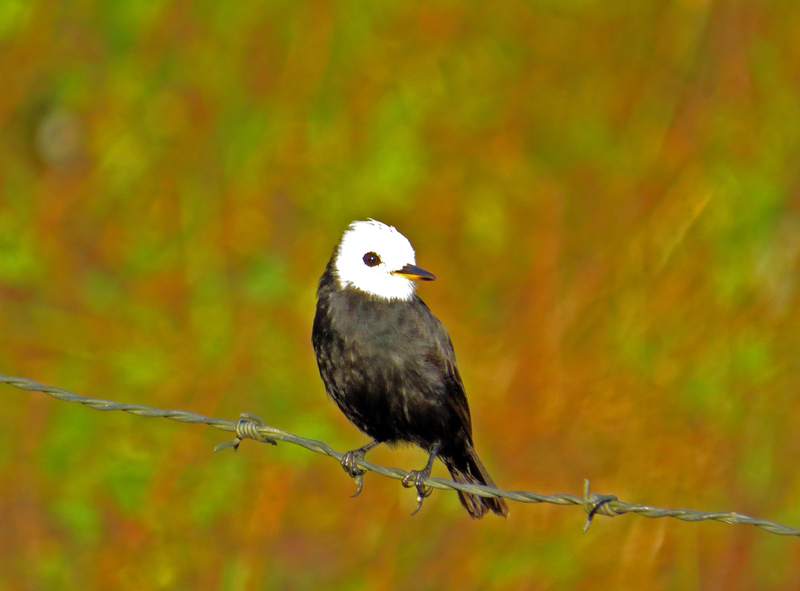 The attractive White-headed Marsh Tyrant is a much commoner and widespread bird. Overhead we had great views of the largest of the lowland New World vultures (the Andean Condor of course is the largest). 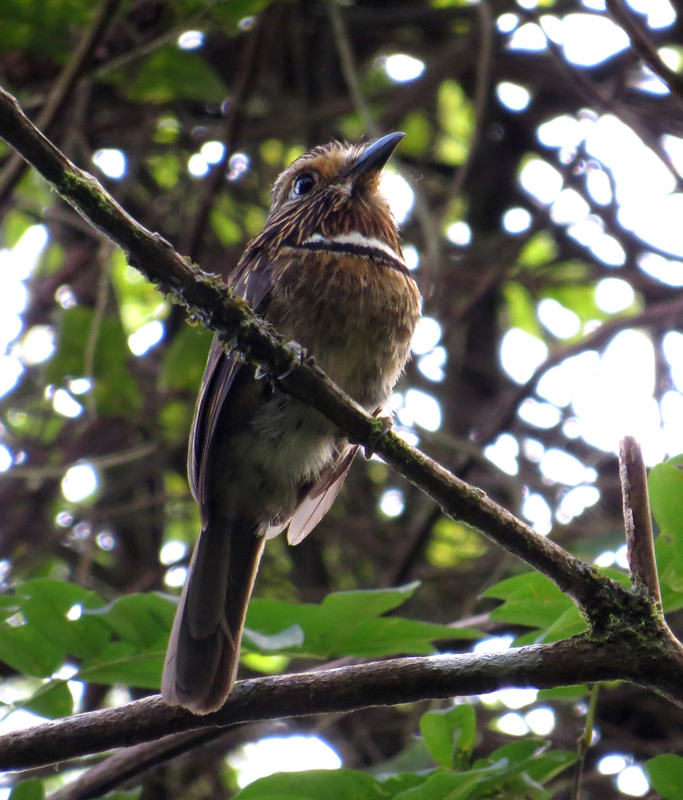 Further south in coastal Bahia State we came across another range restricted antbird – Fringe-backed Fire-eye. …. 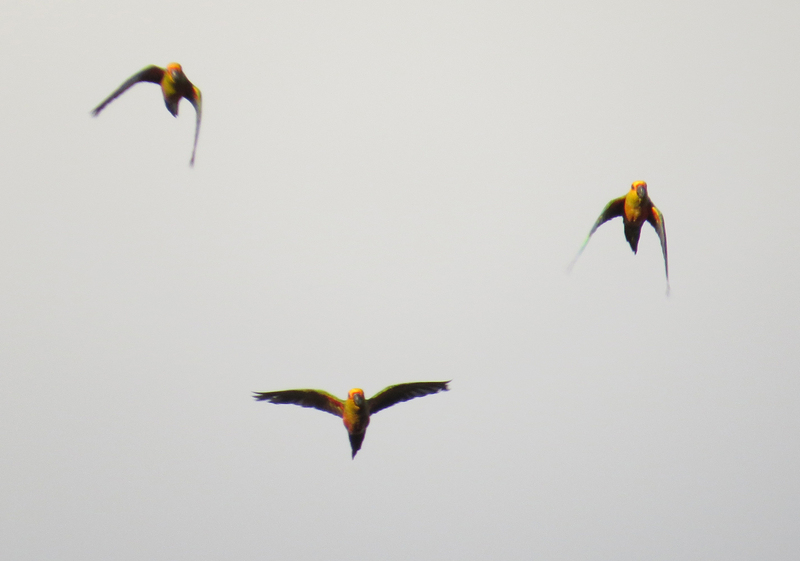 the endemic Jandaya Parakeets flying to roost. 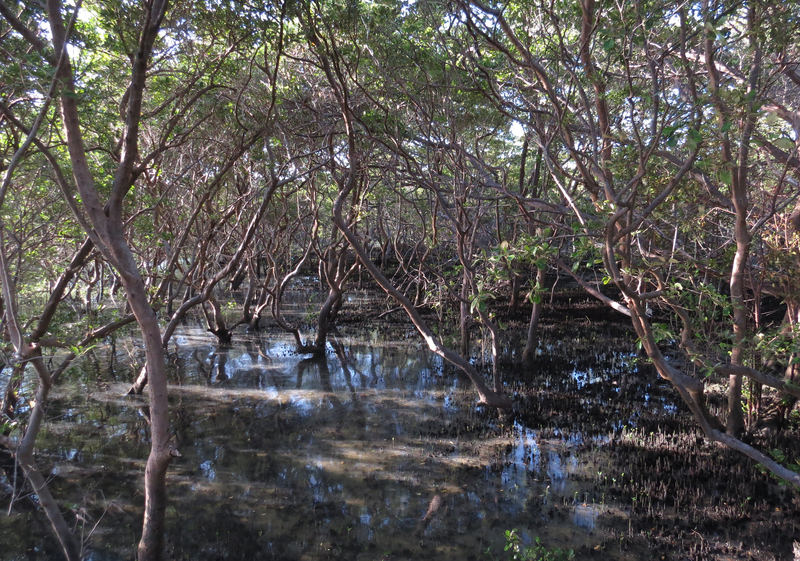 Searching mangroves the following morning we located several of the recently split Mangrove Rails, but they refused to be coaxed from deep cover and remained a ‘heard only’. However a chance encounter with another tour group gave us great scope views of the coastal Rufous Crab-hawk, but it was too distant for decent photos. 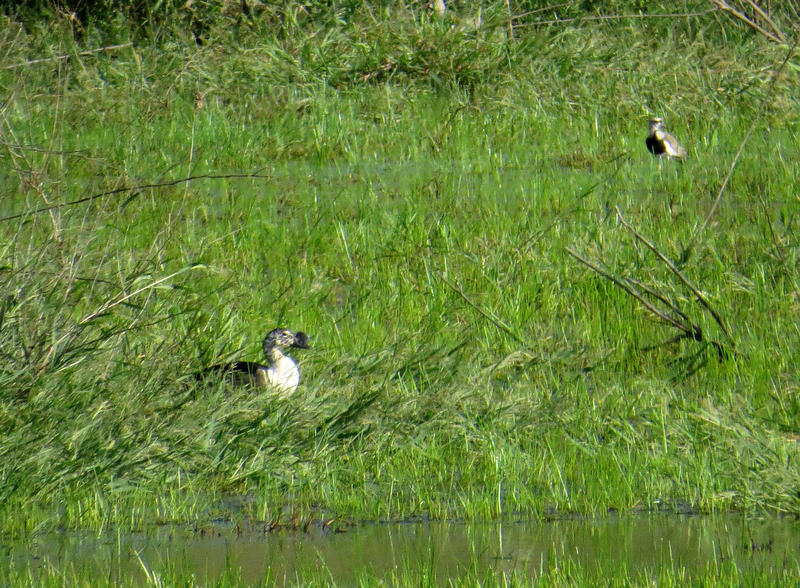 On route we saw the trip’s only Comb Duck, a species recently split from the Old World Knob-billed Goose. Chestnut-headed Blackbirds frequented these roadside marshes. Moving back inland, we stayed for a couple of nights in the charming town of Lencois. 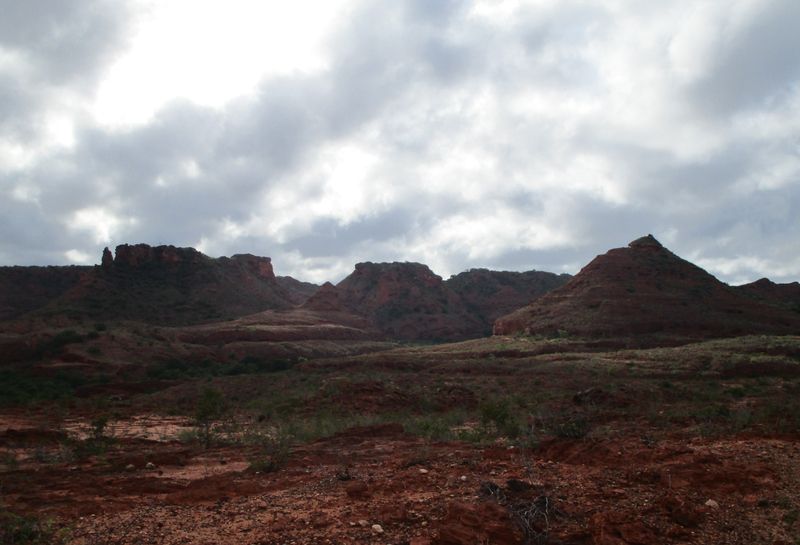 From here we explored the nearby Chapada de Diamantina and surround caatinga. You’re not going to be confused as to which is which with these toilet door signs! 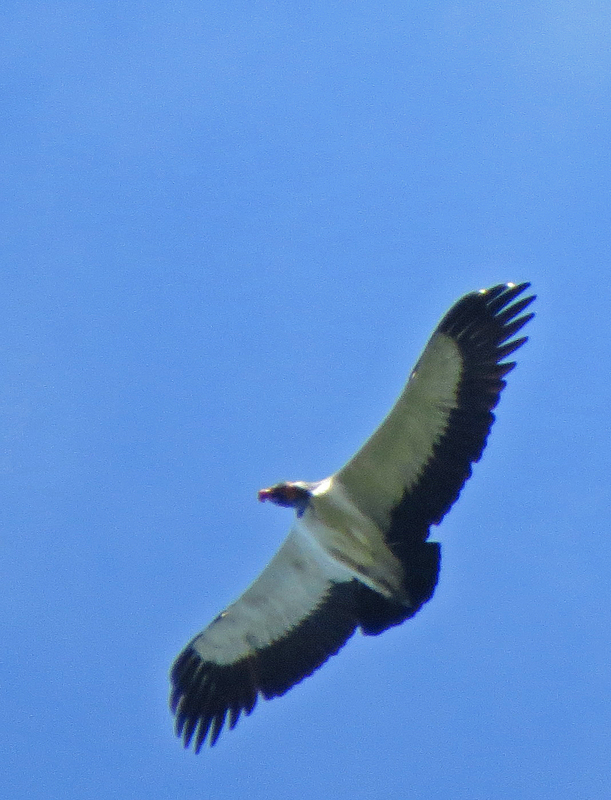 A nearby river valley held two very special birds …. …. 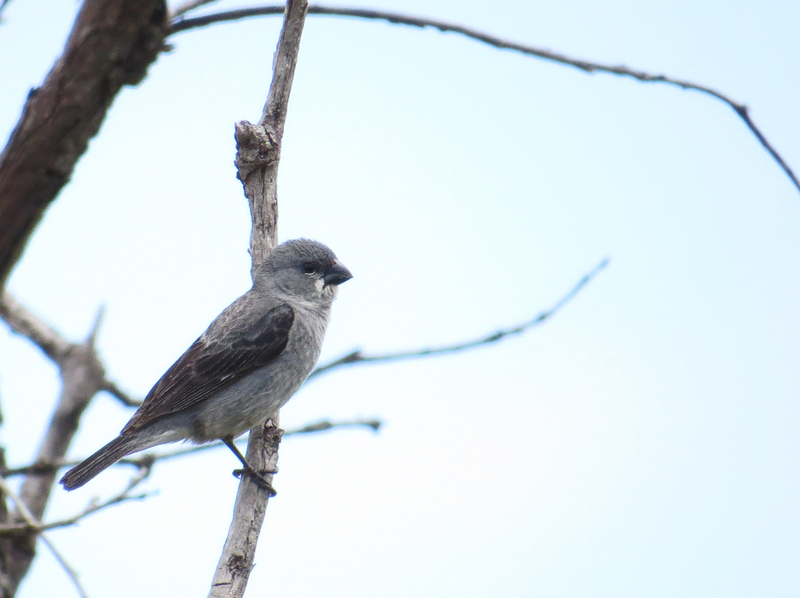 Sao Francisco Sparrow, named after the regions largest river …. 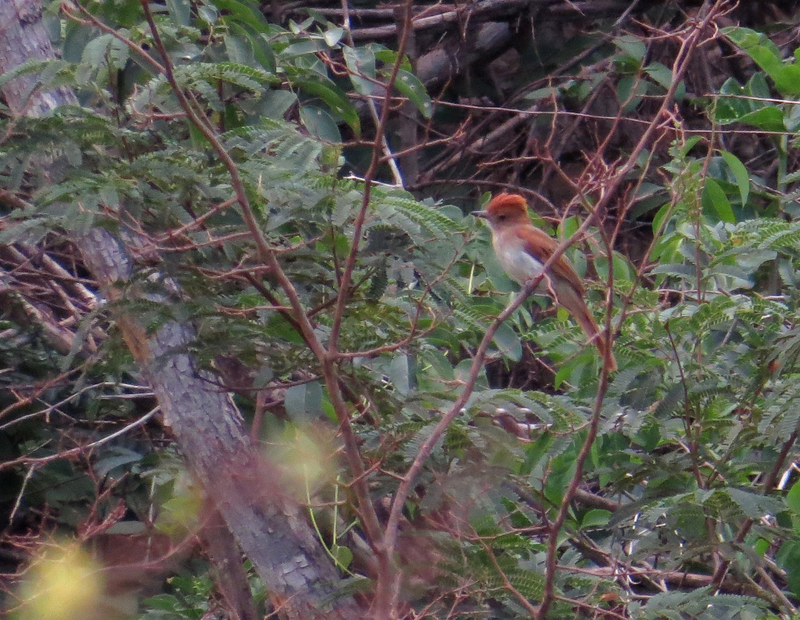 … and Ash-throated Casiornis, a seldom seen tyrant flycatcher that looks more like a furnarid. 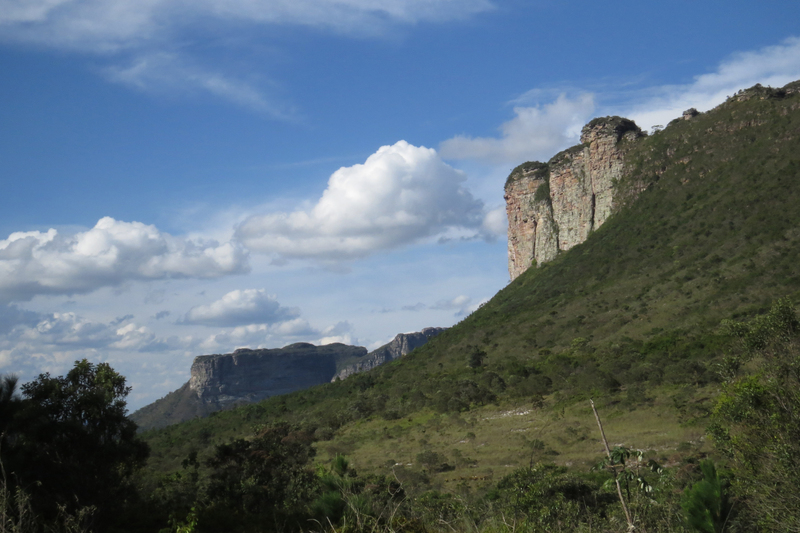 The Chapada de Diamantina consists of many tepui-like rock outcrops and is scenically very attractive. 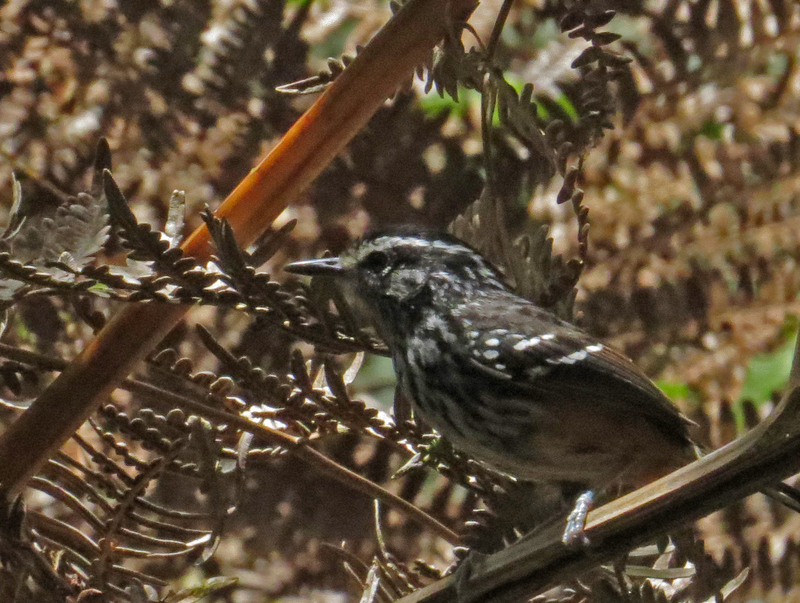 Among the many great birds we saw was Sincora Antwren, a bird described as recently as 2007 …. …. 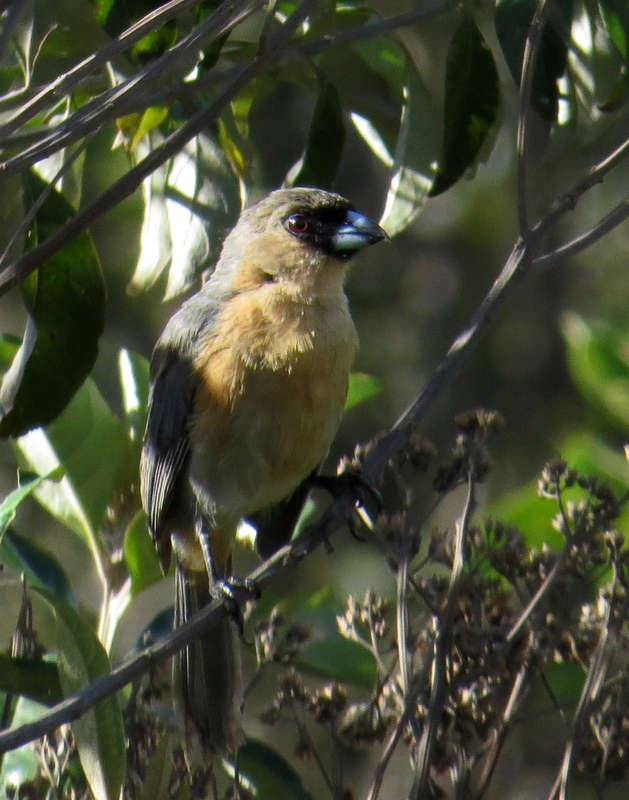 and Serra Finch, another eastern Brazil speciality. 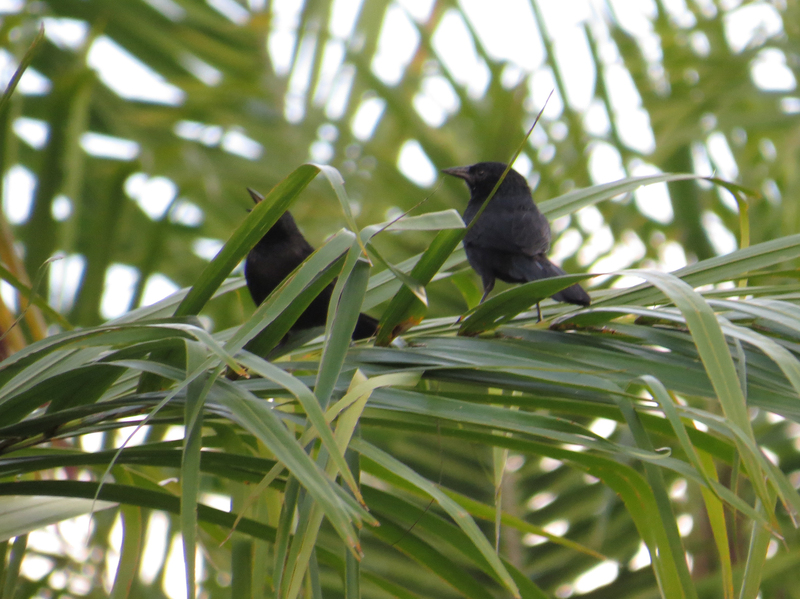 One of the best birds we saw in the area was another recently described species, Diamantina Tapaculo. To get to see this rarity we had to battle our way through thick scrub and climb down into this rocky gully. Our first attempt was unsuccessful, which was frustrating as our leader had already located it on a ‘recce’ whilst we were having lunch, so we knew it was there. But our attempt the next morning was successful, but no pictures were obtained of this little skulker. This slightly blurred photo of a Red-cowled Cardinal looks like (but isn’t) something out of John Dunning’s ‘South American Land Birds’. Long before any good field guides existed for South American, JD mist-netted many South American species and photographed them in a special photography cage, complete with a few branches to perch on and a pale blue background to mimic the sky. For a long time this book was the best guide available. 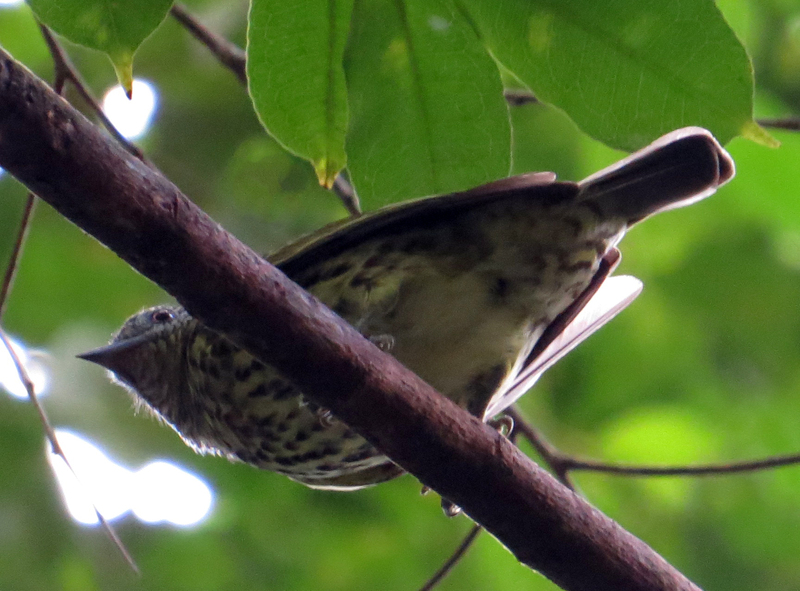 Also endemic to NE Brazil is the Campo Troupial, a species of icterid or New World blackbird. 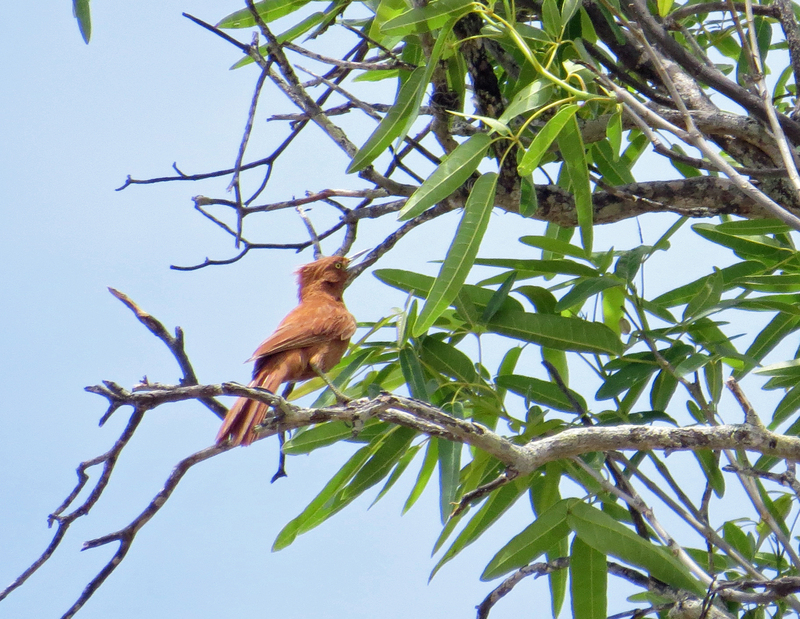 Cinnamon Tanager, another eastern Brazilian bird. 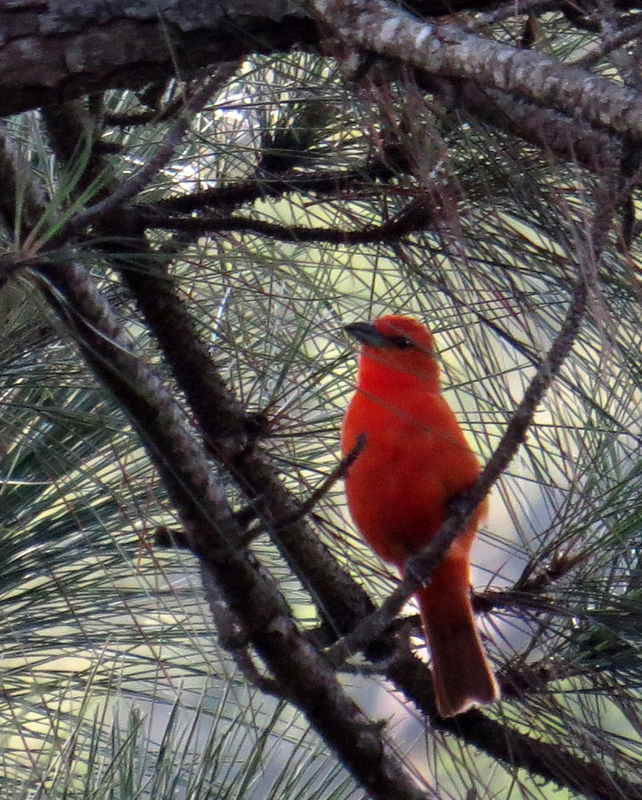 The former Hepatic Tanager has been split into three, the Central American populations which reach as far north as the south-west USA, retain the name Hepatic Tanager, the Andean forms are now known as Tooth-billed Tanager and this, the lowland form, is appropriately known as Red Tanager. 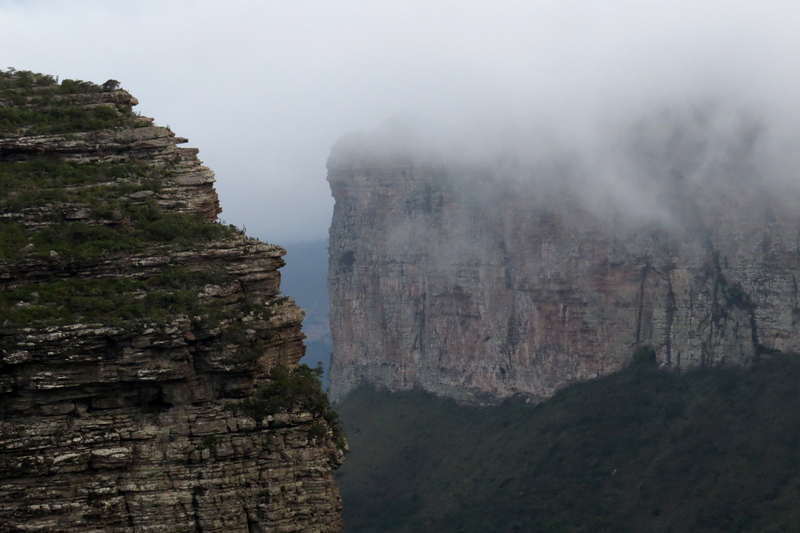 The following morning we climbed high into the tepui-like cliffs of the Chapada de Diamantina, but early morning mist obscured the views. 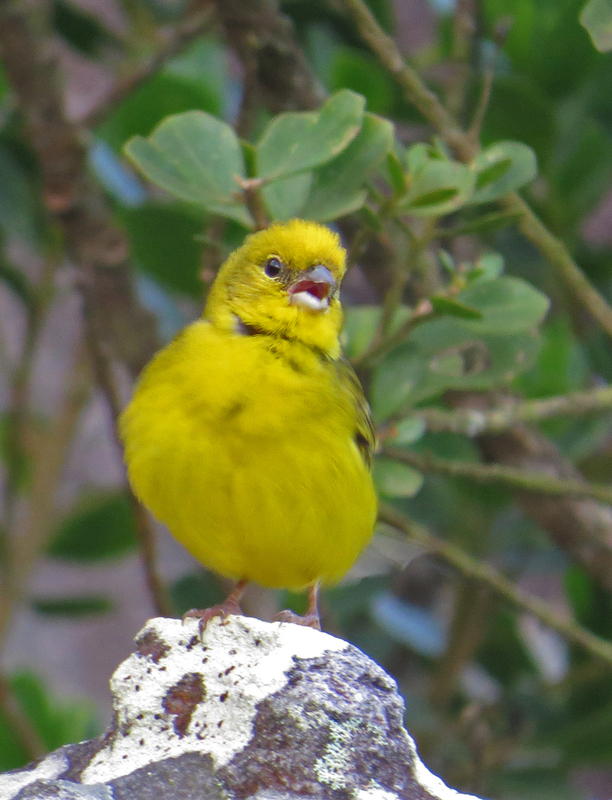 Out targets, Stripe-tailed Yellow-finch …. …. the beautiful Hooded Visorbearer …. … and the drab Velvety Black Tyrant soon fell. On the way down we found the cloud had lifted slightly, partially revealing the dramatic scenery. Lower down we found the stunning Blue Finch, but at a considerable distance. 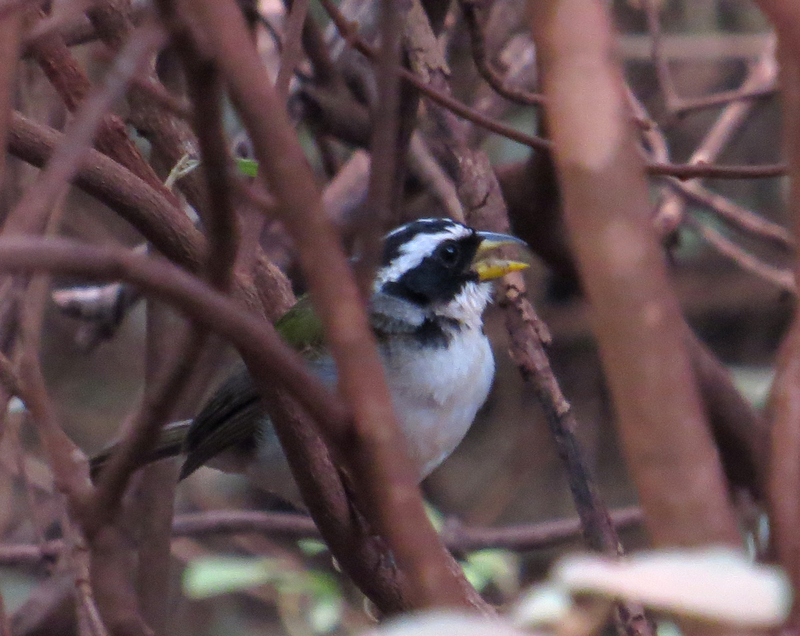 However this Black-throated Saltator performed at close range. 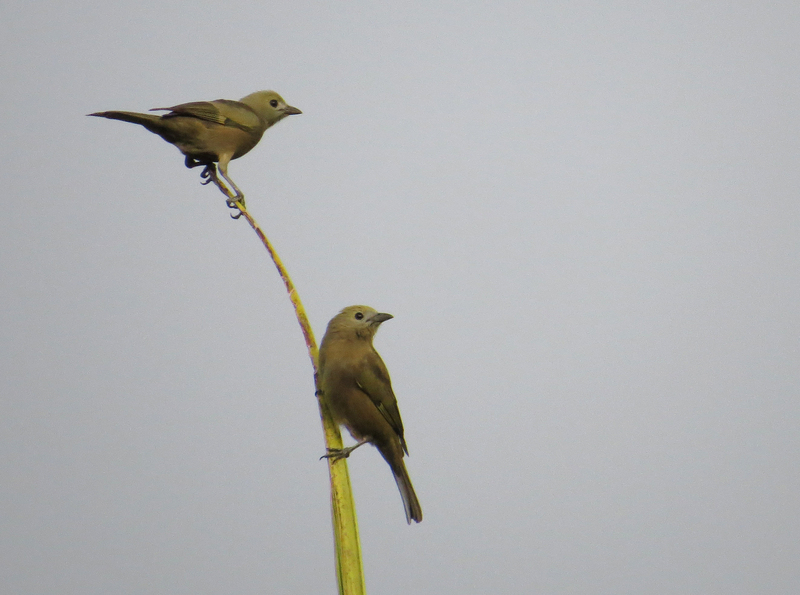 The Shrike-like Tanager is just that, a spitting image of the Old World Lesser Grey Shrike, apart from lacking a hooked bill and an evil look to its beady eye. 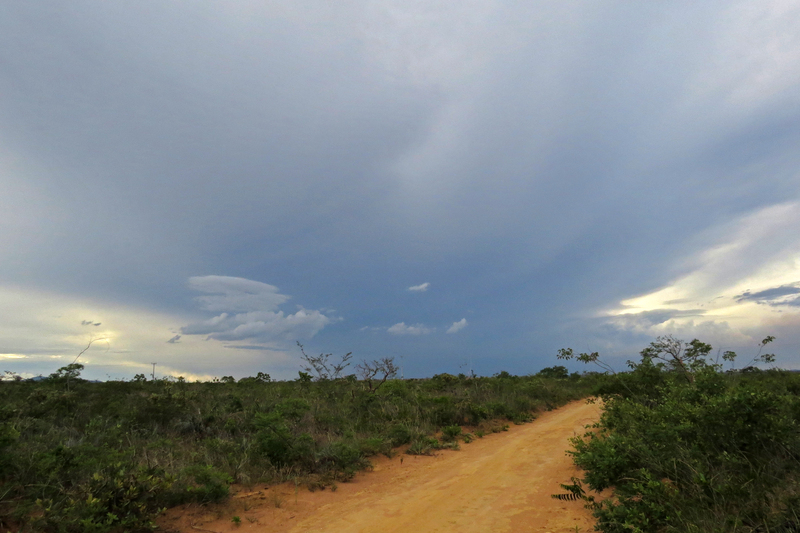 Not far from Lencois we birded an extensive area of caatinga. 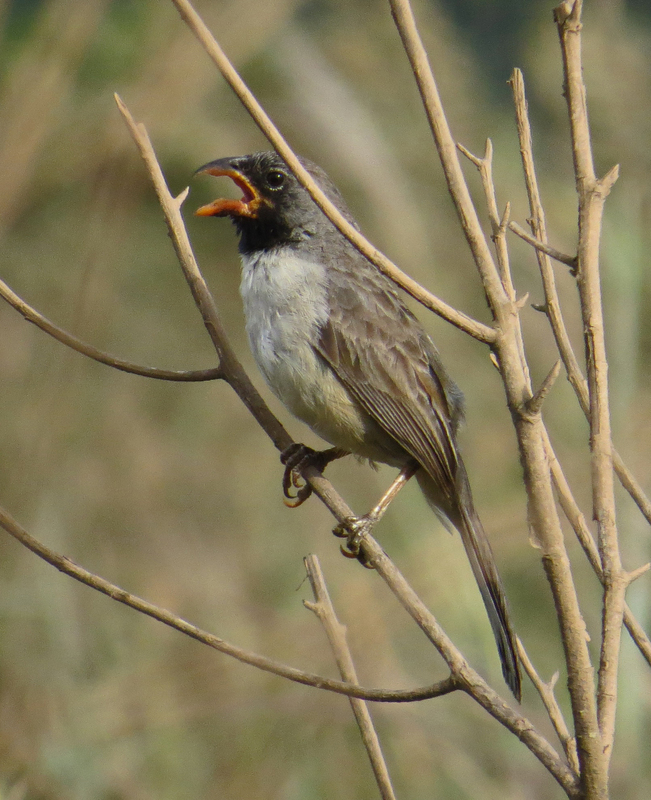 Plumbeous Seedeater was one of many scarce or range restricted seedeaters we were to see on the tour. 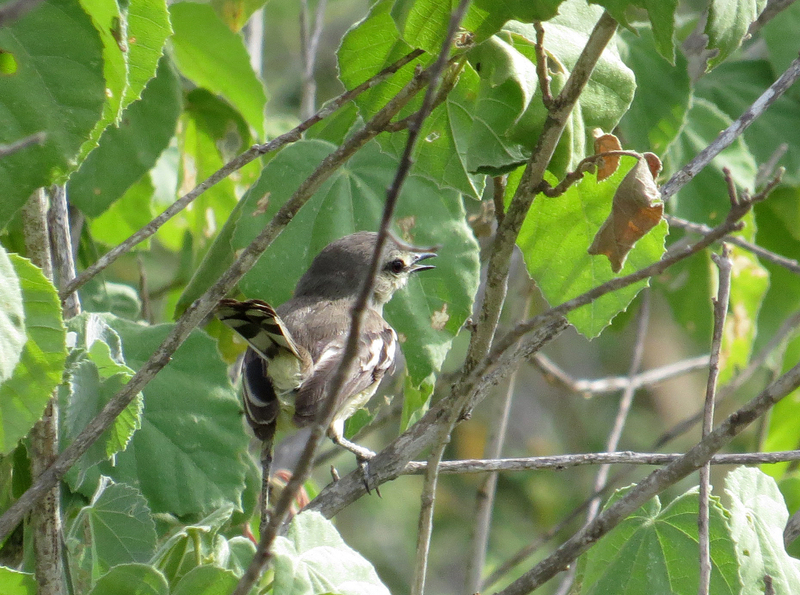 We had great views of Collared Crescentchest. The four species of crescentchest are now considered to be a separate family Melanopareiidae, rather than being included in the tapaculos. 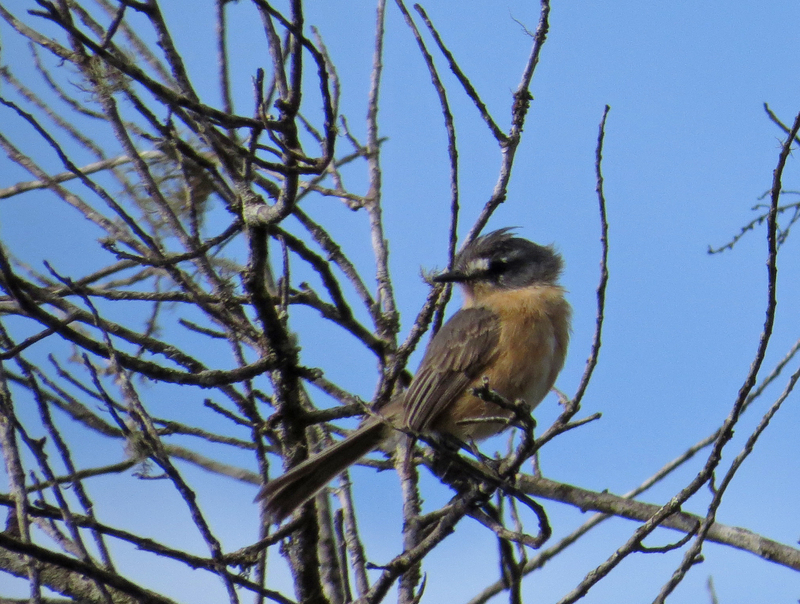 Other goodies included the tiny Grey-backed Tachuri, a diminutive tyrant-flycatcher …. …. 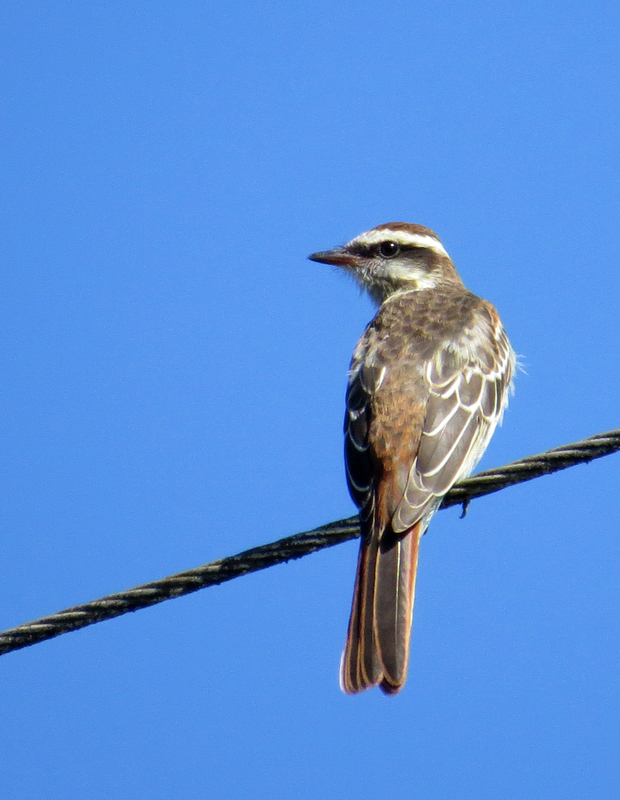 the dainty Sharp-tailed Tyrant …. …. and some scary looking spiders. 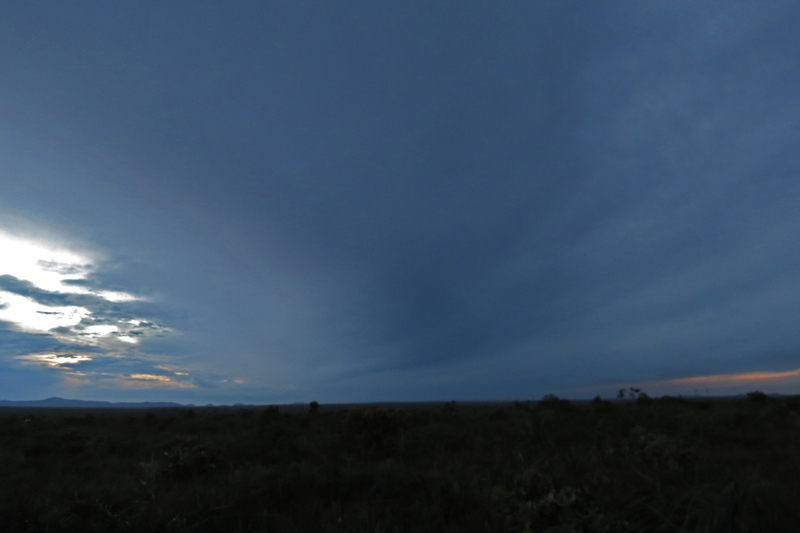 Dark clouds gathered as dusk fell …. …. but that didn’t prevent an impressive gathering of 15 or so Least Nighthawks. From here we continued south heading for Mucage and Boa Nova. This will be the subject of the next post. This was the sticker on the wall of our accommodation at Canudos in the state of Bahia in Brazil, however we hadn’t come all this way to see Hyacinth Macaw, which occurs in the Pantanal in the far south-west, but its near relative Lear’s Macaw. Many birds are named after people. Often these are the discoverers of the bird or ornithologists who the describer feels needs recognition. but only seldom are birds named after people who are more famous for their activities in other fields. There are a few exceptions, some birds are named after royalty (for example King of Saxony Bird of Paradise) and Allan Octavian Hume (1829 – 1912) is better known as a political reformer and the founder of the Indian National Congress than for his extensive work on the birds on India. 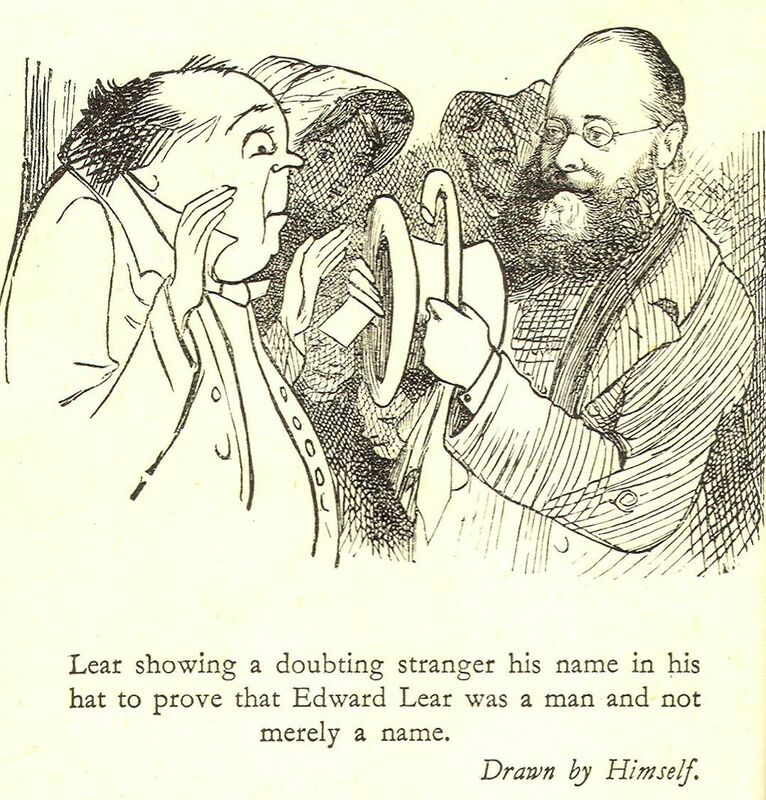 Another Victorian ornithologist better known for his non-ornithological work is Edward Lear (1812 – 1888). Picture from Wikipedia. 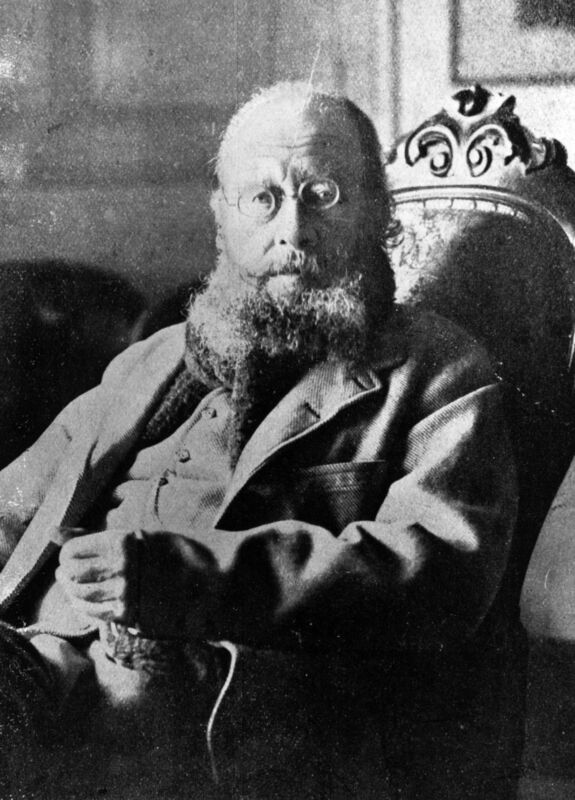 Lear, of course, is best known for his comic poems and short stories, including the ‘owl and the pussycat’ and ‘a book of nonsense’, a collection of limericks. He was also a talented artist and was employed by the Zoological Society as an ‘ornithological draughtsman’. Picture from Wikipedia. 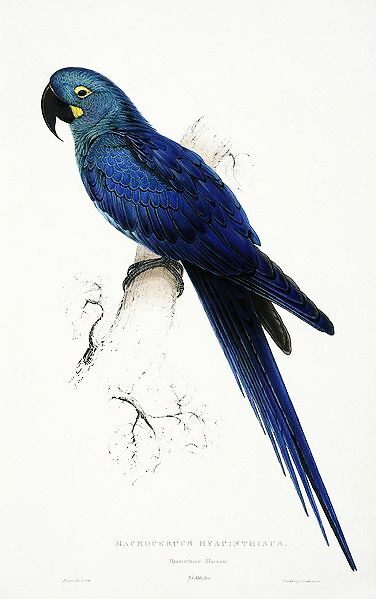 He painted many birds including the illustrations of the Family of Psittacidae, or Parrots in 1830, which contained this picture, thought initially to be either a Hyacinth Macaw or the now extinct Glaucous Macaw, but later recognised to be a species in its own right and named Lear’s Macaw Anodorhynchus leari after it’s illustrator . The trouble was nobody knew where it came from, occasional skins and birds in the pet trade would turn up but it wasn’t until 1978 when Helmut Sick mounted an expedition to a remote area in north-east Brazil that the breeding grounds of this enigmatic species were found. 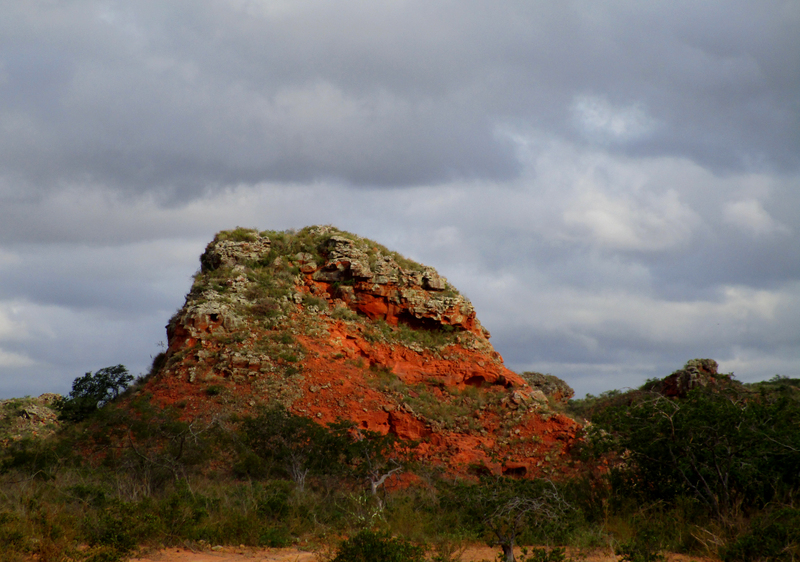 Thought then to number only about 250 individuals, this area now known as the Canudos Biological Preserve is protected and numbers have increased to around 1000. Picture from Wikipedia. Of course, the area is now much more populated than when Sick first visited, but to be there for first light still requires a 0330 start from the town of Canudos. 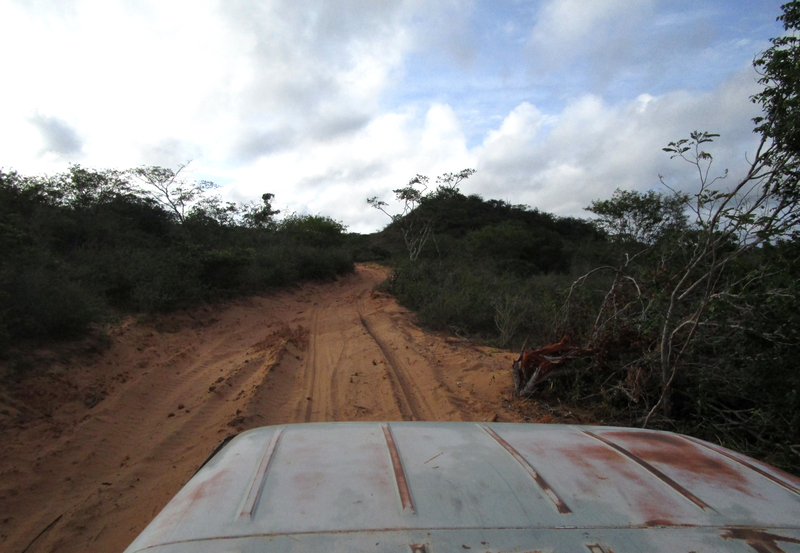 We transferred from our minibus to a open-backed 4×4 for an hour-long drive along bumpy tracks. We arrived at the lookout as dawn was breaking. 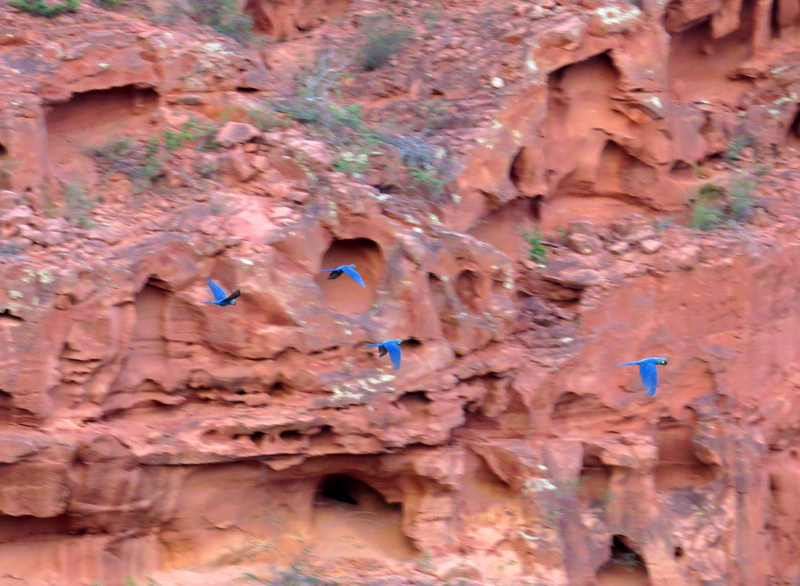 Soon macaws stared coming out of their roost but views were poor. 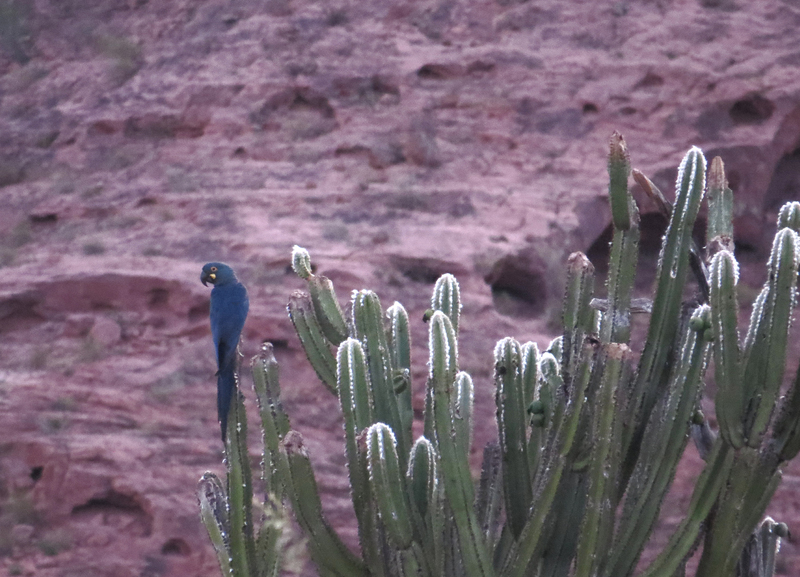 A small number perched on nearby cacti. Once it was fully light we could appreciate the beauty of our surroundings. One sandstone ridge after another stretched to the horizon. 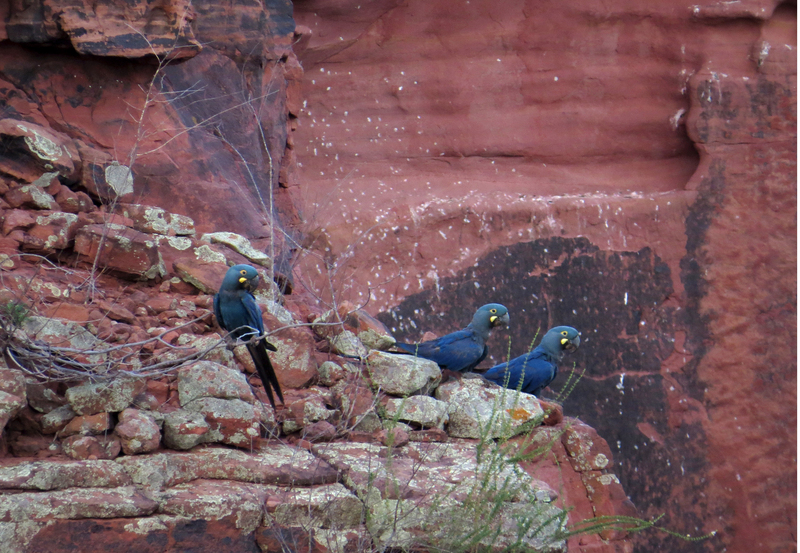 After a while all the macaws made their noisy departure, we thought that was it, but the local ranger took us to another nearby canyon …. 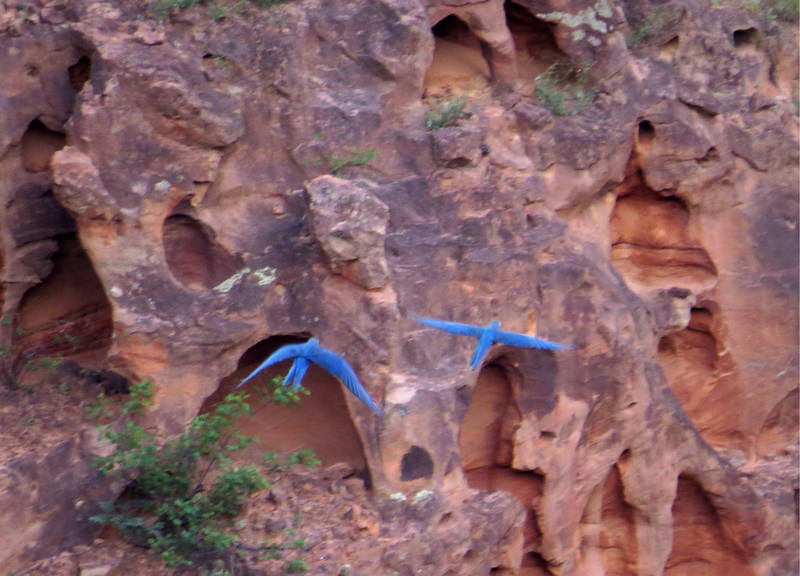 … here we had views of 50+ Lear’s Macaws, either perched distantly or in flight. 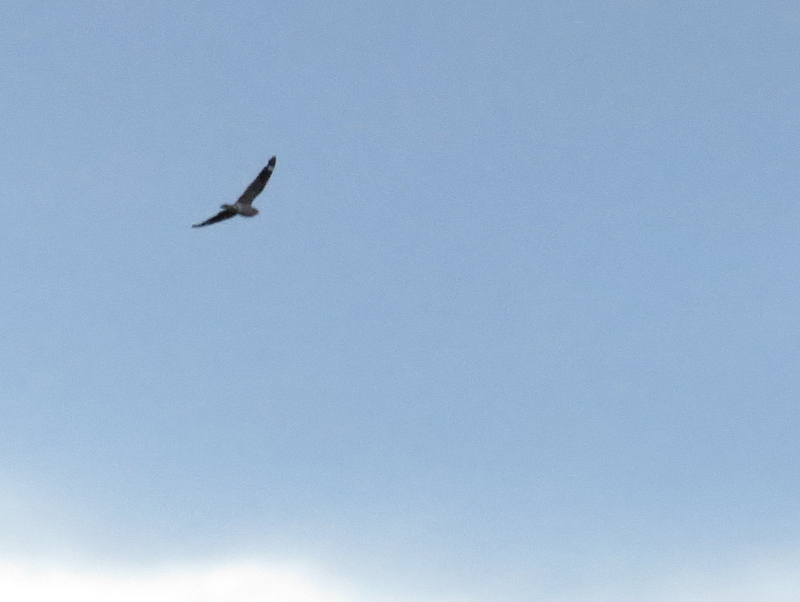 One group repeatedly flew close …..
…. 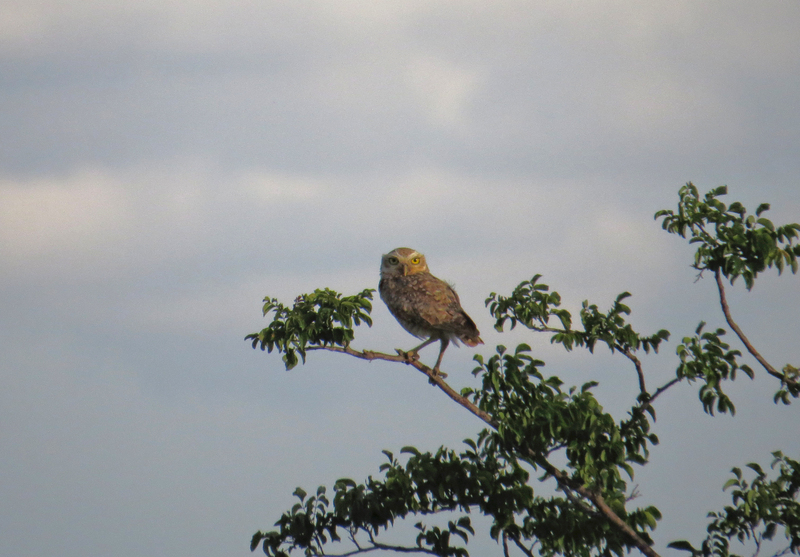 and perched up nicely on a nearby cliff …. …. before flying off again. 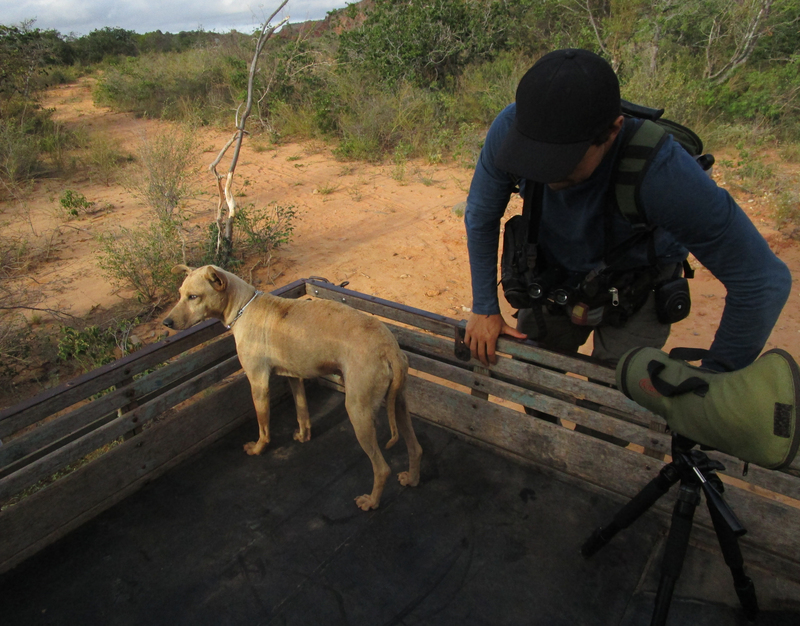 Then it was time to join the ranger’s dog in the back of the pick up …. …. and hold on tight for another bumpy ride on the return to Canudos for a late and much appreciated breakfast. Lear’s Macaw didn’t quite make it as bird of the trip, two complete surprises, Giant Snipe and White-winged Potoo, pipped it at the post …. …. 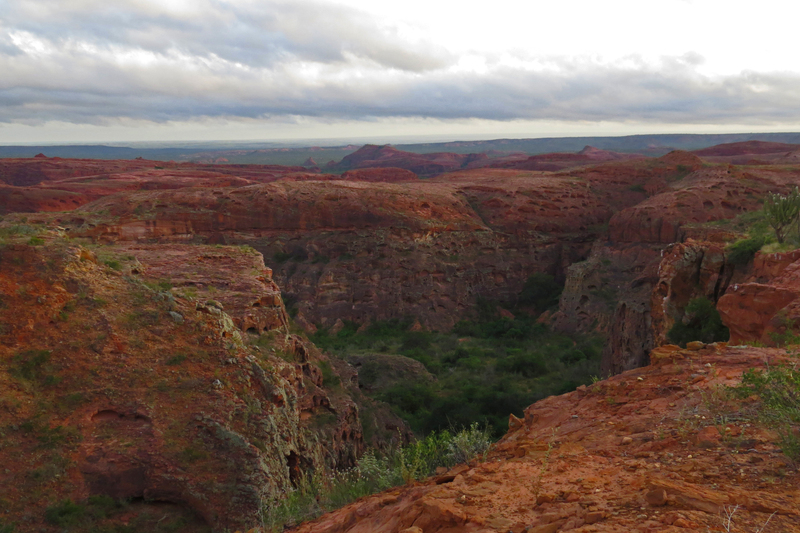 but the morning at the Canudos Biological Station, with its stunning eroded sandstone outcrops and canyons plus the wonderful macaws, certainly warranted the title of ‘experience of the trip’. I have been to Brazil twice before, to the endemic rich forests of the south-east in 2003 and to the wetlands of the Pantanal, the grasslands of Canastra and the southern Amazonian rainforest in 2008. 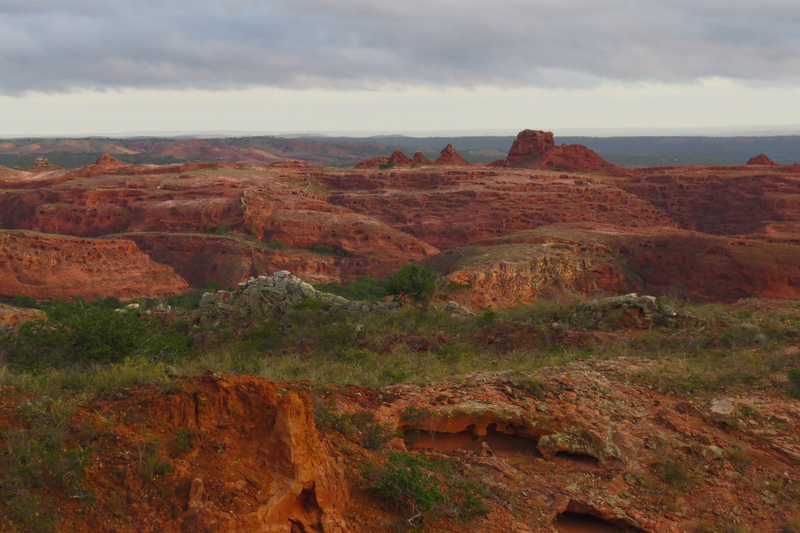 This trip visited the coastal forests, caatinga, cerrado and canyons of the north-east states of Ceara, Alagoas, Penambuco and Bahia. Although, obviously there was considerable overlap with the birds of the south-east, I still managed to see 78 new species, about 10 more than I had expected. 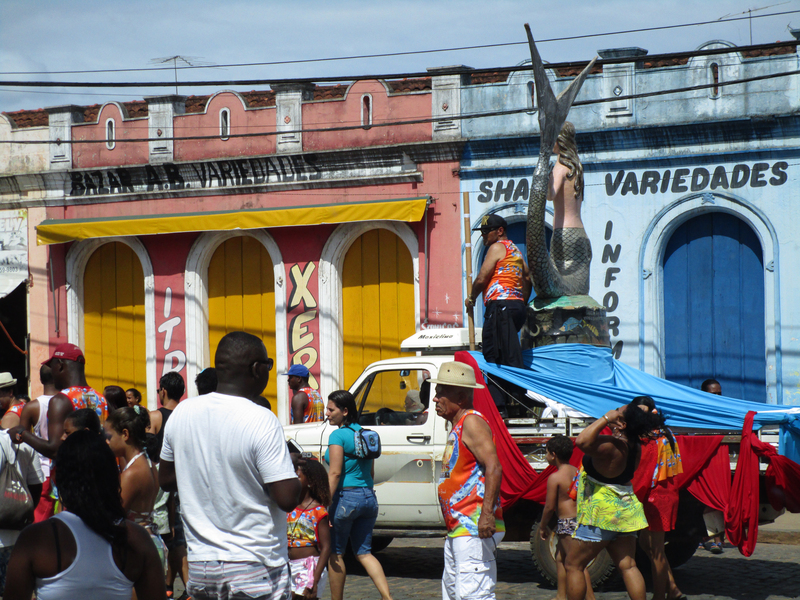 This post covers the northern state of Ceara, western Perambuco and northern Bahia. On arrival at Fortaleza we had a three-hour drive to our first destination. We didn’t get to the hotel until nearly 0200 so it was a rather short night. Soon after dawn we were birding at a nearby area of mangroves but our main target, the endemic Little Wood-Rail failed to show. Not the best start to the trip! Birding from this boardwalk was pleasant but a few migrant waders and coastal herons was little compensation for a serious dip. 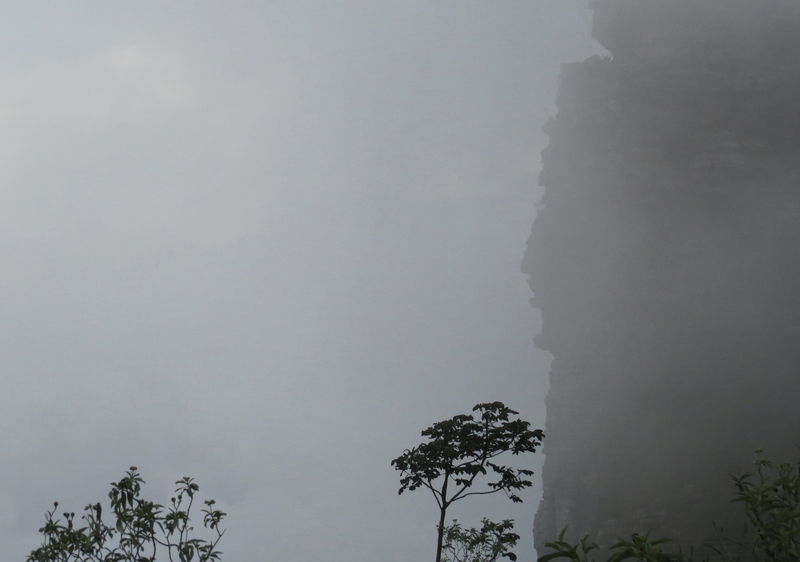 By mid afternoon we arrived at the Serra do Baturite, a coastal range covered in Atlantic rainforest. 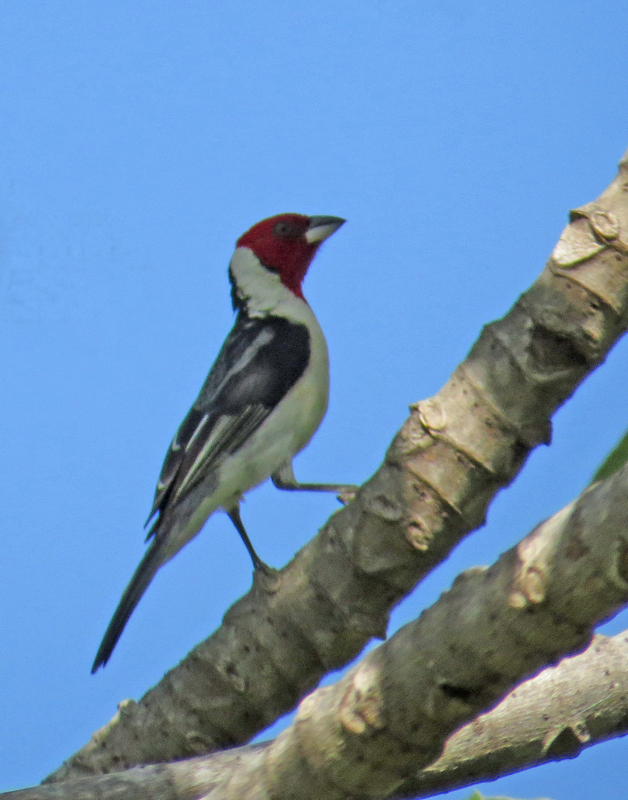 There was excellent birding in the area, which lifted our spirits considerably. 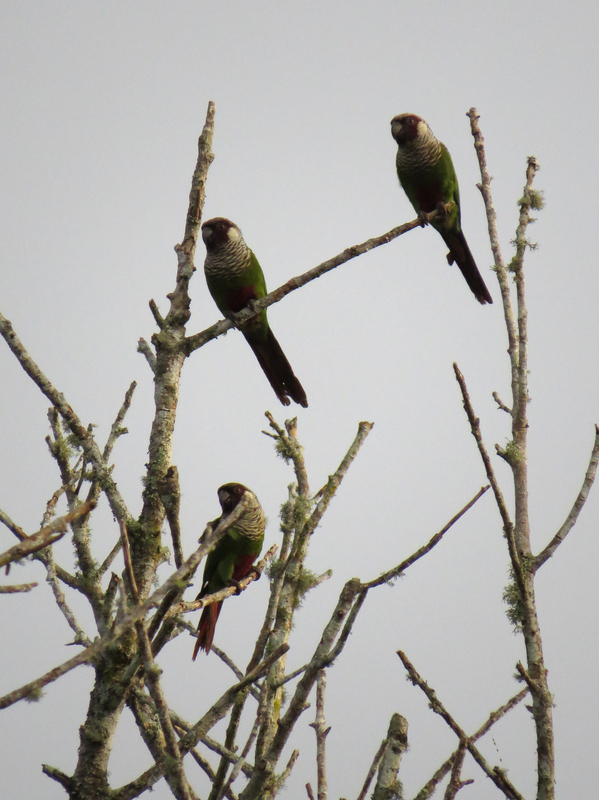 Birds included the endemic Grey-breasted Parakeet …. …. the beautiful Band-tailed Manikin …. …. 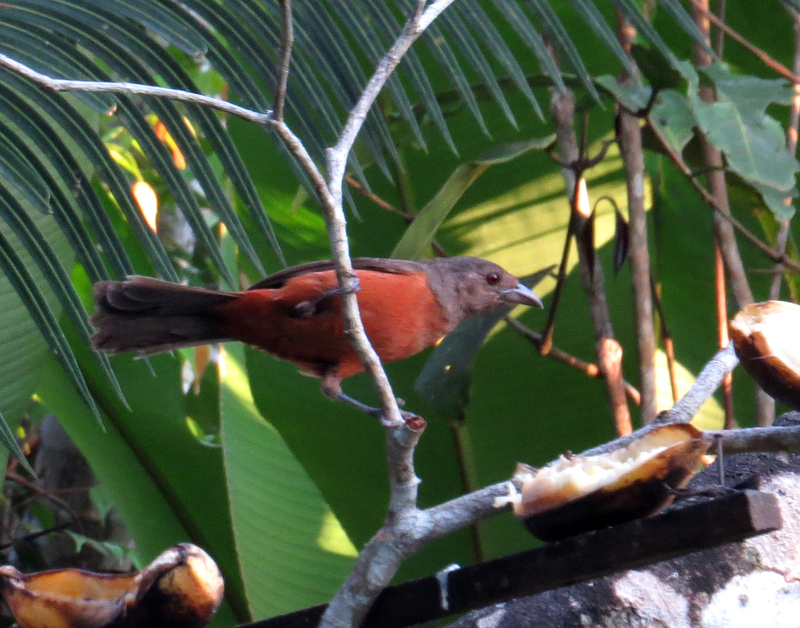 gorgeous Red-necked Tanagers …. …. and one of the smallest woodpeckers in the world, Ochraceous Piculet, one of four species of piculet that we were to see on the trip. Skulking on the forest floor we were able to glimpse a Rufous-breasted Leaftosser …. …. and the recently split Ceara Gnateater. …. 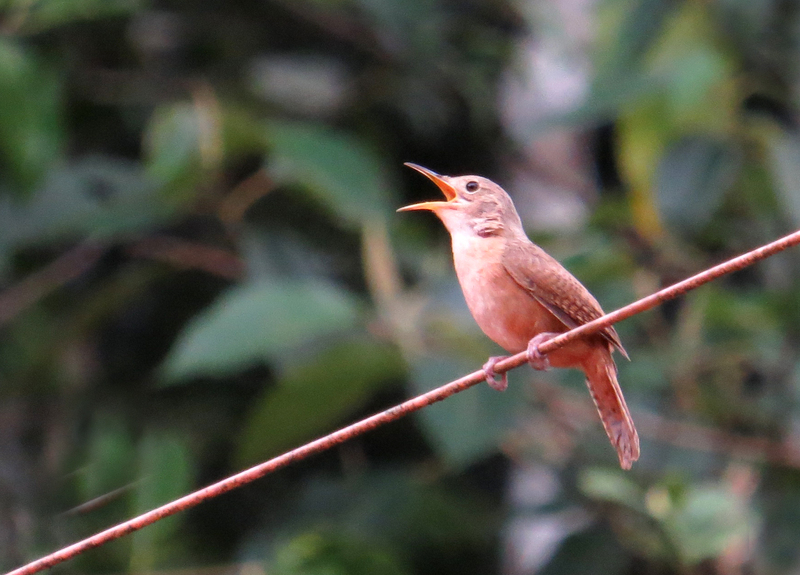 and House Wren competed for our attention. 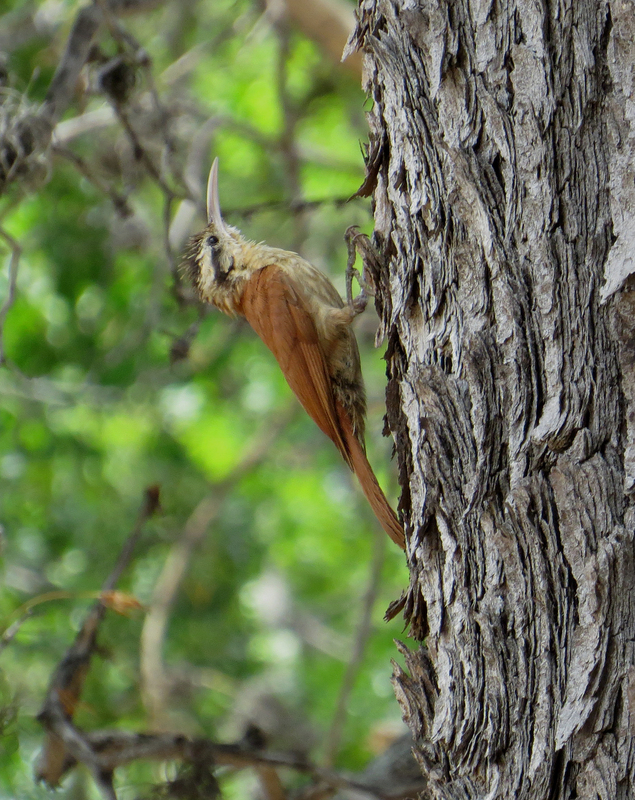 House Wrens occur from Canada to Argentina and various proposals have been put forwards to divide it into a number of species, but they yet to gain approval by the various checklist authorities. 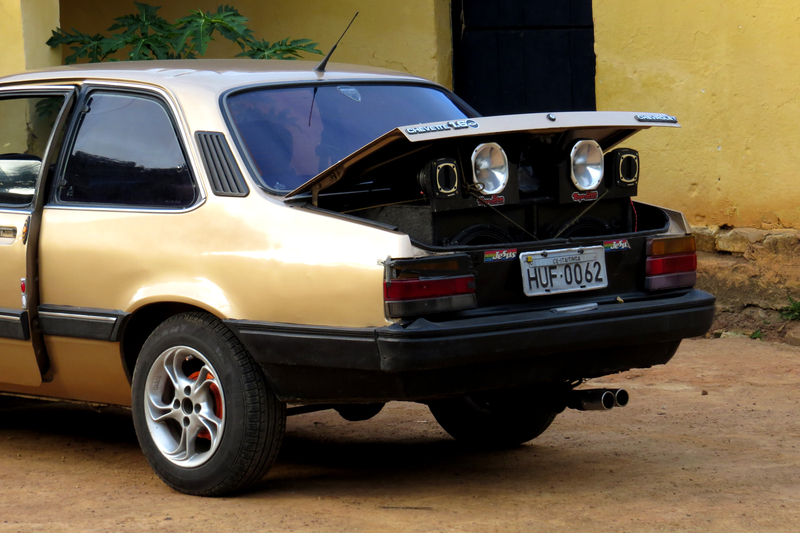 One trouble with Brazil is that is so noisy. Many cars fit this sort of sound system in the boot of their car, which is clearly not intended as in-car entertainment but as means of annoying anyone who wants a good nights sleep. From a ridge over the local resort we were able to scan the tree tops for raptors but had little success. The white dot on the lake is, of all things, a Mute Swan, but somehow it didn’t make it onto the trip list. 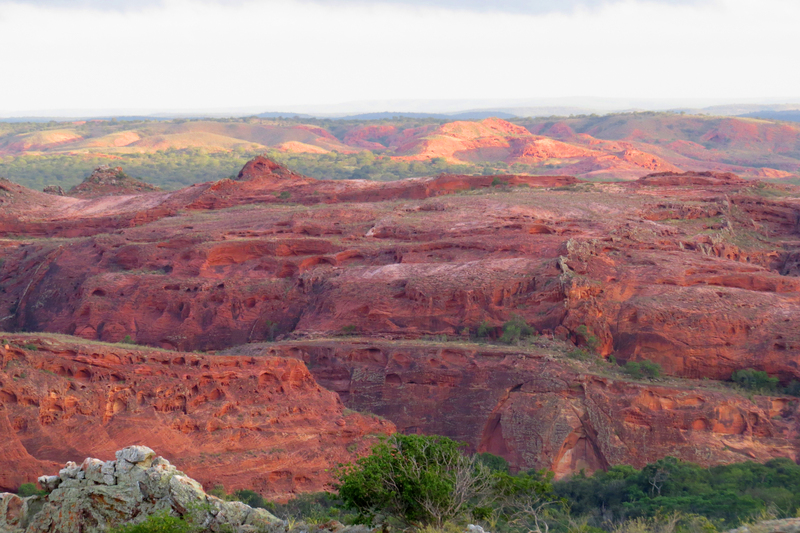 From Serra do Baturite we drove south to areas of extensive caatinga, a habitat comprised of xerophytic scrub interspersed with stands of cactus. Small differences in the level of aridity produce different height vegetation, which in turn leads to radically different bird communities. 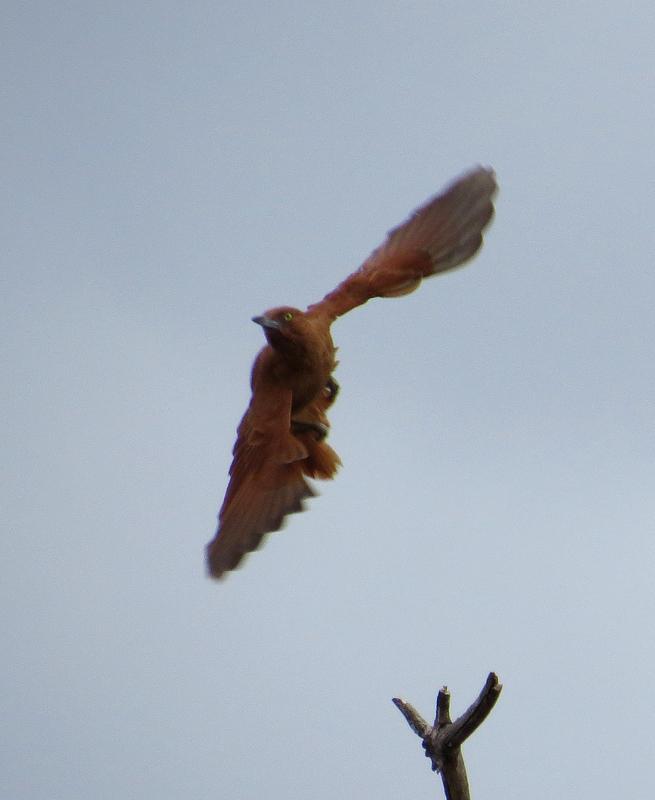 Birds of the caatinga include the appropriately named Caatinga Puffbird …. …. 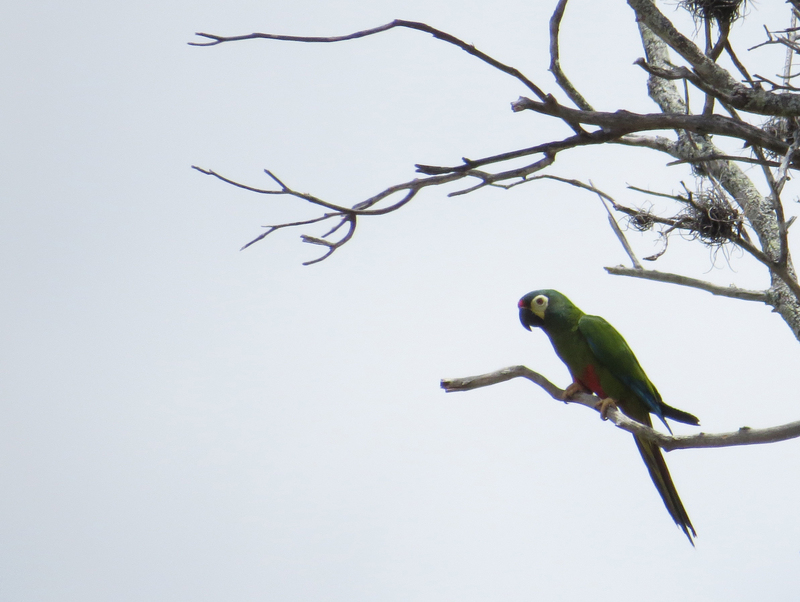 which was followed by the predictable Caatinga Parakeet …. …. 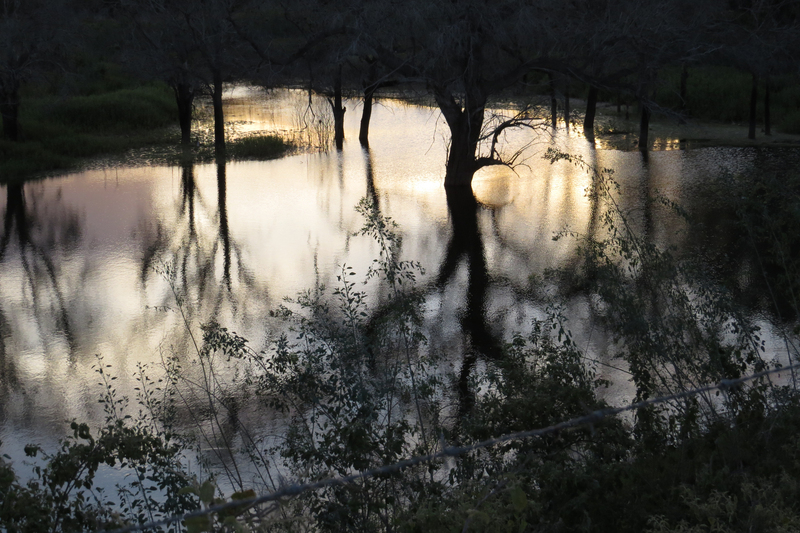 and (you’ve guessed it) the inevitable Caatinga Cacholote …. …. 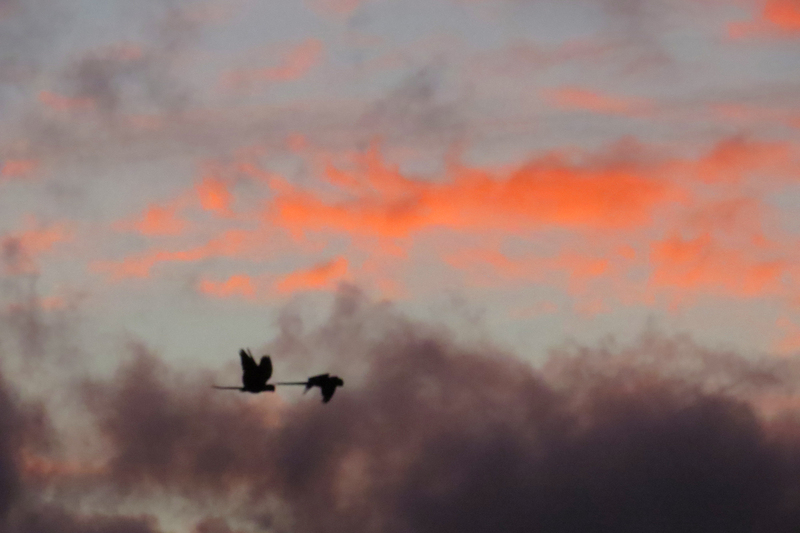 which was captured nicely in flight. In wooded area we saw Narrow-billed Woodpeckers, one of eight woodcreepers we were to see on the trip and one of 48 (if you include the similar scythebills) in South America. Two species of tyrant flycatchers have evolved to look rather like old world wagtails and somewhat unimaginatively are called Lesser and Greater Wagtail-tyrant. I have seen ‘Greater’ a number of times but ‘Lesser’ was a life bird for me. Imagine the confusion when we found a pair of ‘Lessers’ (above) in the same bush as a pair of ‘Greaters’. 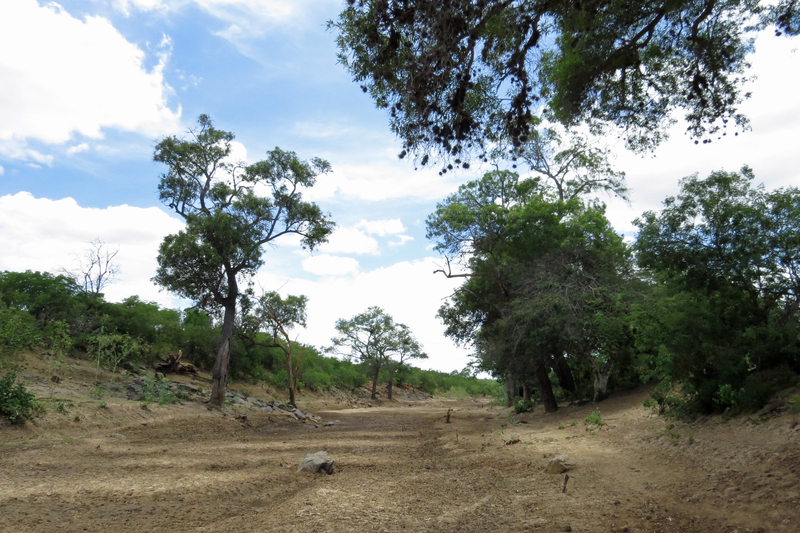 We visited a dried up river bed in northern Bahia, a stake out for Blue-winged Macaws, a species that prefer the tall riparian habitat. In the whole of north-east Brazil there is only one river, the mighty Sao Francisco, that never dries up. And there, just as promised was the lovely Blue-winged Macaw. 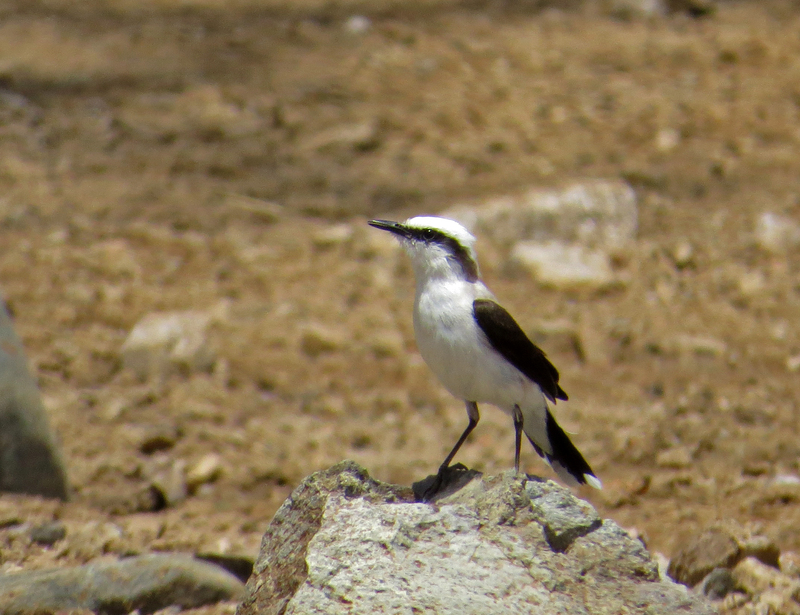 Earlier I mentioned tyrant flycatchers that have evolved to look like wagtails, well here’s one that has evolved to look like a wheatear – Masked Water Tyrant, living in what is currently a water free environment. A more typical tyrant flycatcher (with 431 species, the largest bird family in the world) is the showy Streaked Flycatcher. 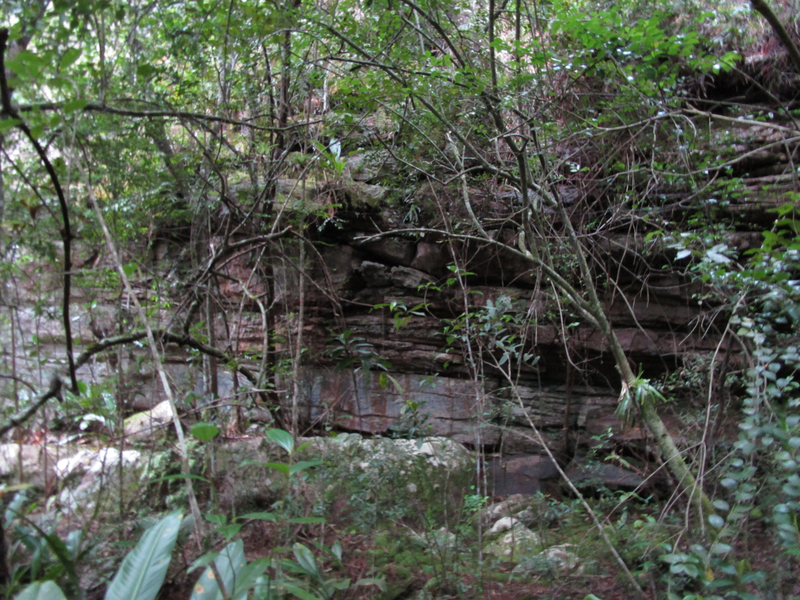 At the base of the isolated plateau of the Chapada do Araripe lies some tall woodland. 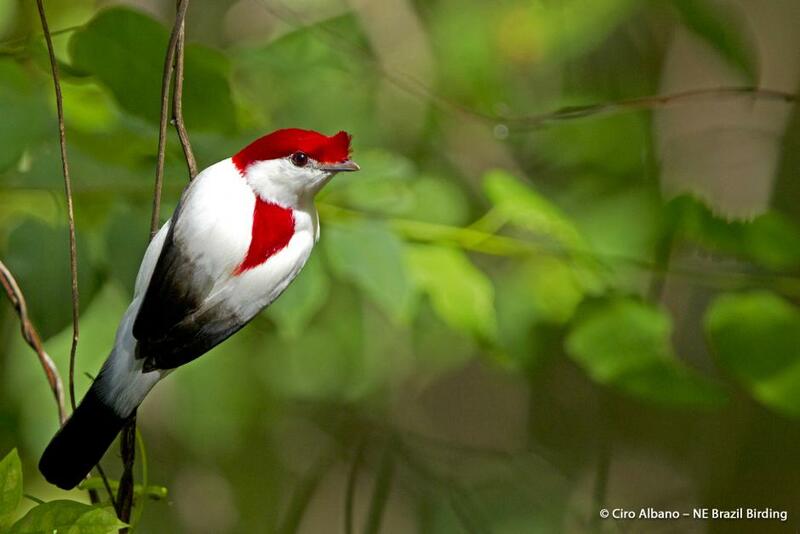 Here in 1996 the gorgeous Araripe Manakin was seen for the first time. The population is estimated to be a mere 500 pairs. Although we got good views, our time with the bird was brief. The most accessible site has been converted to a theme park, we paid our entry fee but were told the park had to close, this seemed bizarre as it was only 11am, but we later learned that the park’s owner had died that morning and the staff were closing the park as a mark of respect. With very little time available to get a decent image of this stunning bird, I have included (with permission) a wonderful shot by Ciro Albano, one of Brazil’s top birders and photographers. 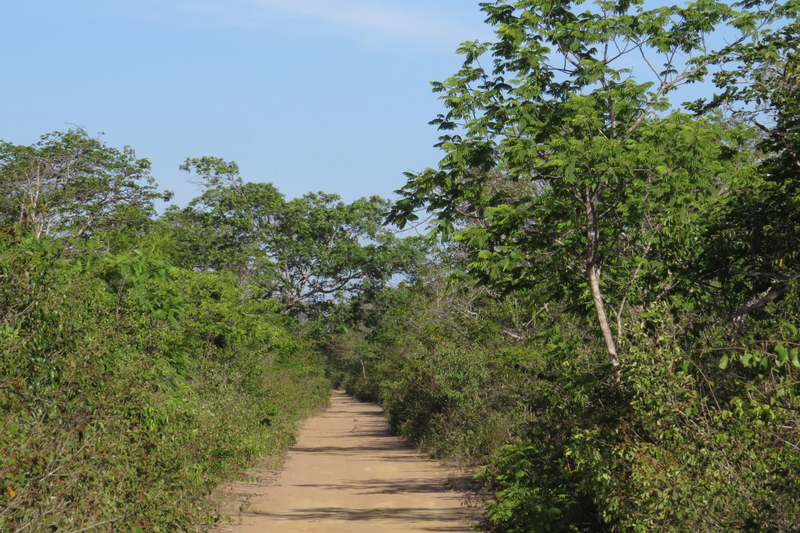 We eventually reached the area around Canudos where we searched an area of scrub for the rare Scarlet-throated Tanagers, which we saw, albeit distantly. More showy species included the widespread Burrowing Owl. 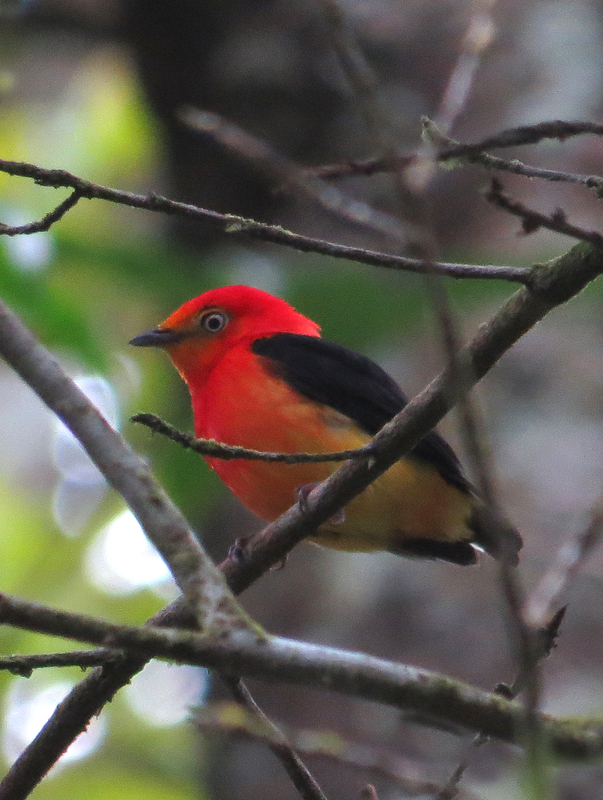 As the sun set, the lake where the Scarlet-throated Tanagers could be seen glowed as if lit from within. We saw a couple of the very rare Lear’s Macaws flying to roost but we knew that we had a far better chance of seeing them well the following day. More of that in the next post.